We were Salzburg bound and I had a plan for how to get there, later that afternoon, so about 90 minutes were spent doing REX trains between Mitte and Rennweg, two of which turned up with EMU’s, before heading over to Wien Meidling and doing one of the two hourly Railjet’s round to Wien Westbahnhof to commence our journey towards Salzburg. RJ66 1310 Budapest Keleti – Munich Hbf was 1116209 into Westbahnhof, where it dropped onto the set for RJ866 1630 Wien Westbahnhof – Innsbruck with 1116200. 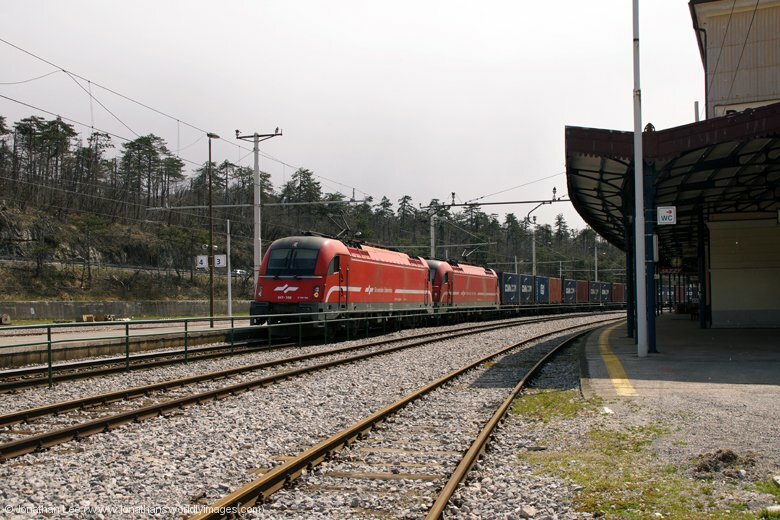 The two trains then run combined to Salzburg and split again to head their separate ways. At St Polten 1144288 was sat in the adjacent platform with REX1628 1600 Wien Westbahnhof – St Valentin which we did out to Prinzersdorf to be greeted with 1142637 heading R2079 1654 Pochlarn – St Polten local. 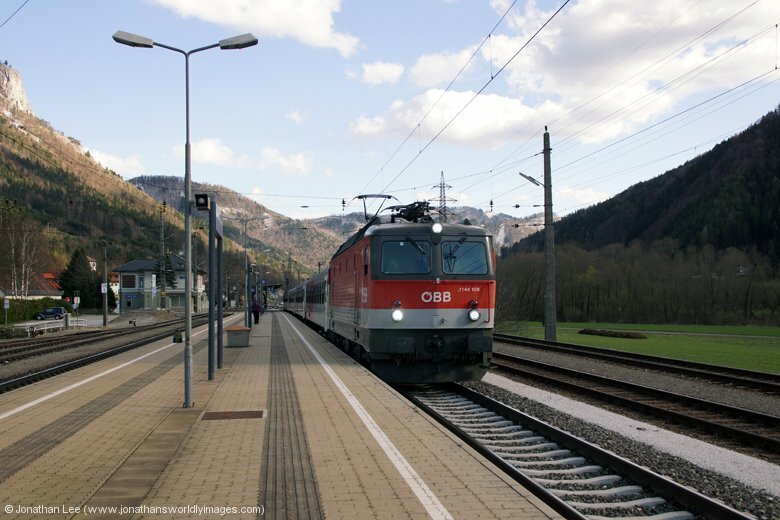 1016039 was soon along with IC742 1656 Wien Westbahnhof – Salzburg which we did forward to Linz where we gathered supplies for the following day while we waited for RJ760 1730 Wien Westbahnhof – Bregenz, which topped off a decent afternoon with 1116226 heading one set and 1116210 the other, which ran combined to Salzburg where one set is detached. It was a nice empty train too, allowing us to relax for the final leg of our journey to Salzburg. While my wife did her thing in the morning I nipped out to see what I could spin in during the morning rush. Which to be honest didn’t seem to materialize. 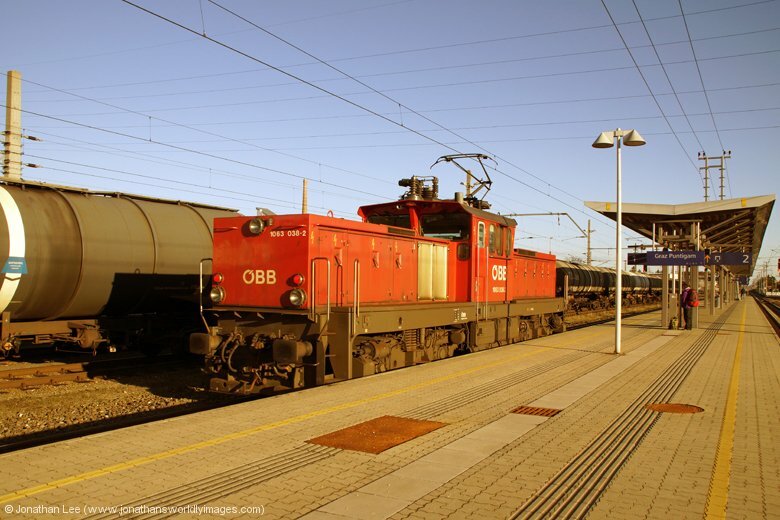 Having watched 1144286 depart Salzburg Hbf with 5887 0716 to Freilassing I then did 2016069 behind it, on REX5889 0616 Braunau am Inn – Freilassing, to Taxham Europark for 1144286 back in on its return to Salzburg Hbf with 5094 0746 Freilassing – Salzburg. 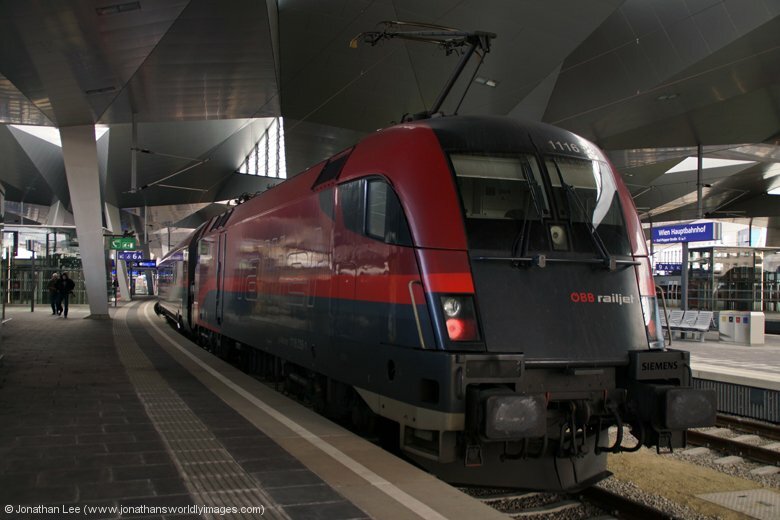 The plan was then to head out to Salzburg Sud on IC513 0815 Salzburg – Graz but when I found 1144101 waiting to depart with it on platform 1 I opted to do 1142639 on REX1662 0511 Summerau – Taxham Europark, to Salzburg Aiglhof instead; for 1144286 back in for the second time of the morning, as it returned from Freilassing with 5886 0825 Freilassing – Linz Hbf. Then it was breakfast time! The choice at breakfast was plentiful and the 6th floor vantage point had decent views over Salzburg and across to the fortress over on the hilltop; unfortunately the hotel’s windows were filthy, there were all sorts of structures in the way and pigeons nesting in the eaves. Other than that the view was great! By the time we headed out to do or touristy bits the weather had improved a little, it had been dark, cold and miserable when I’d been out earlier; now it was just cloudy and cold! Having got our bearings while taking the walk into town the previous night, we headed down towards the river to follow it towards town; from the moment you reach it the fortress is visible, dominating the skyline, right the way down towards the old town. By midafternoon, feeling rather windswept, we called it a day and headed back to the hotel to get away from it all. I of course then opted to nip out for an afternoon spin about and when I saw the screen at the station, with some very late and even cancelled trains, I knew something was wrong. 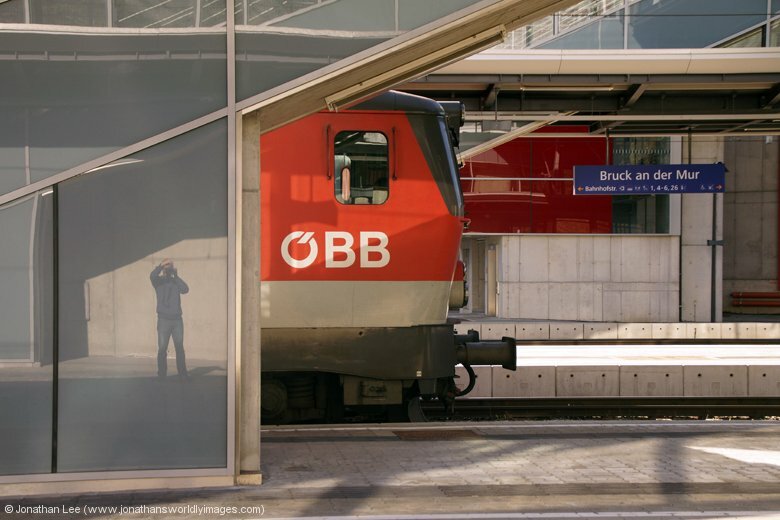 There were also some OBB staff on the concourse giving out advice, one of whom confirmed to me that there were problems in Germany, specifically near Munich, where the high winds had brought trees down and the same had also occurred near Zell am See. 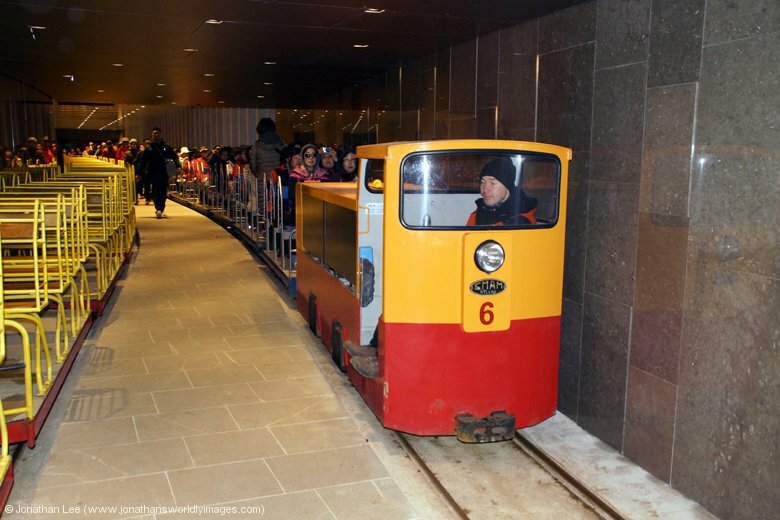 Basically there were no trains via Freilassing to Munich and anything heading via Zell am See was screwed as well. My best laid plans didn’t look like they were going to work as I waited patiently on platform 1 for REX1510 1508 Salzburg – Worgl, which after 5 minutes flashed up on the screen as being 50 minutes late. That seemed to put pay to any bonus move I could do before what I’d actually planned that afternoon so I went downstairs to get a few things from the Spar. 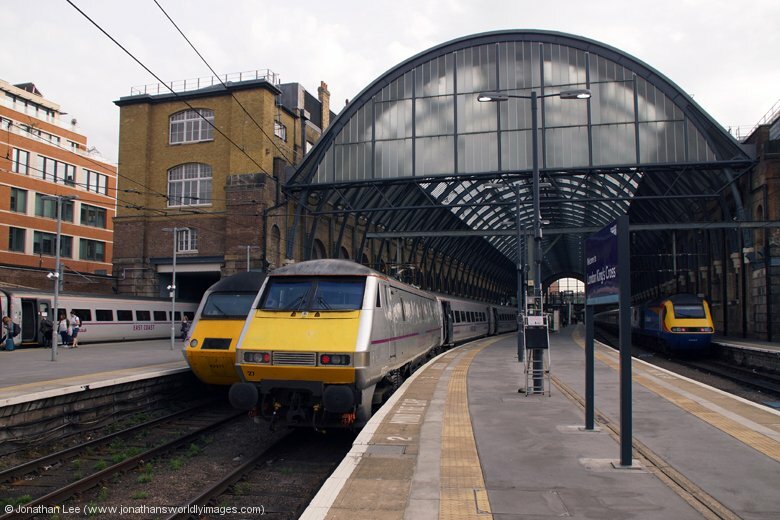 When I walked back out I happened to notice people walking down the stairs from platform 1 and when I glanced up at the screen REX1510 was showing only 20 minutes late at that point; quite where the other 30 minutes of lateness had gone I don’t know. Having fought my way up the stairs I found 1144031 sat waiting to go, literally, the guard was just waiting for the signal to come off before giving the tip. 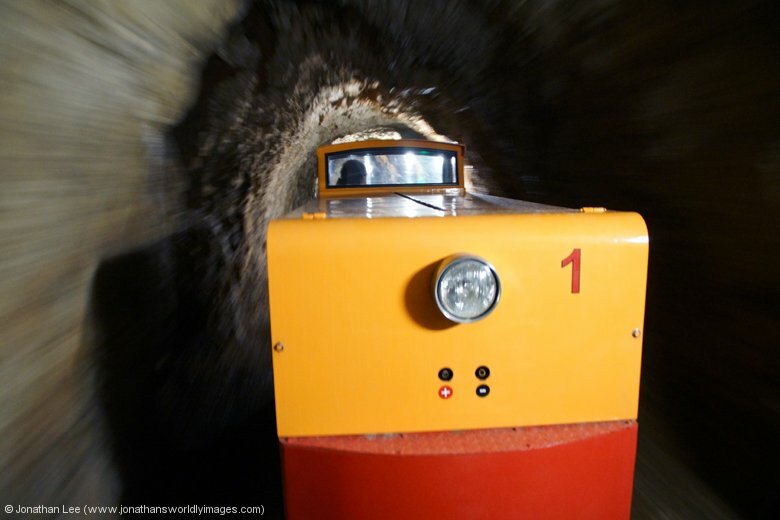 At 16 minutes late the signal came off, the doors were closed and away REX1510 went. It was a plus 17 at Salzburg Sud but I was willing to risk it. Having nearly missed the train myself through mis-information it seemed that quite a few people who’d originally been waiting for REX1510 had not actually boarded it; there’d been at least three people looking out of different doors prior to departure to see where their friends were! Thankfully the plus 17 made at Salzburg Sud, comfortably. 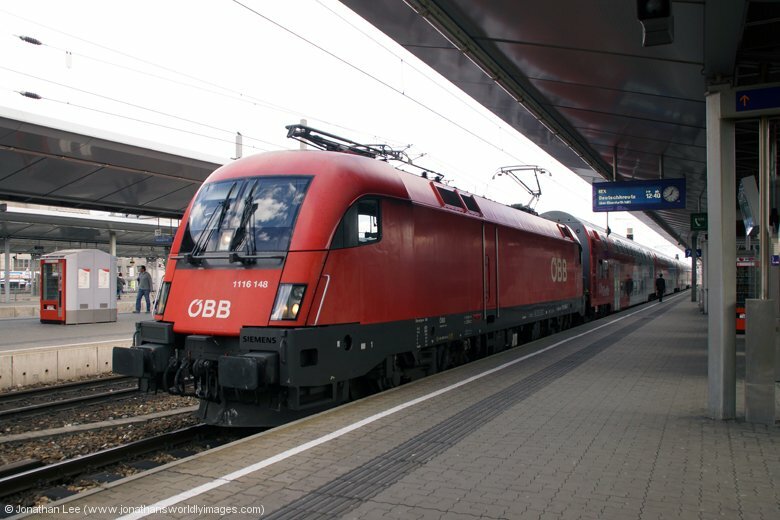 It was a good job it did too as upon arrival at Salzburg Hbf EC216 1145 Graz – Saarbrucken was cancelled and DB 101134 was turned round to form EC115 0619 Munster – Klagenfurt. 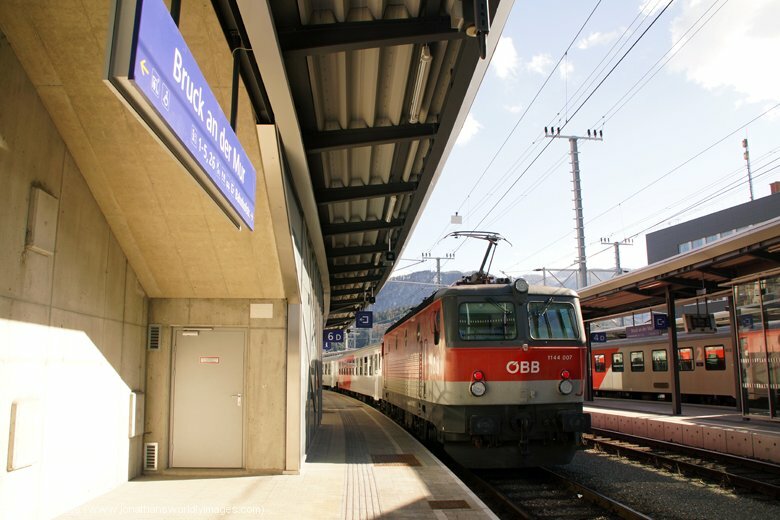 The latter having been turned round in Germany, at Freilassing, by the look of the screens at Salzburg station. EC216 to Freilassing for EC115 back had been my next planned move! 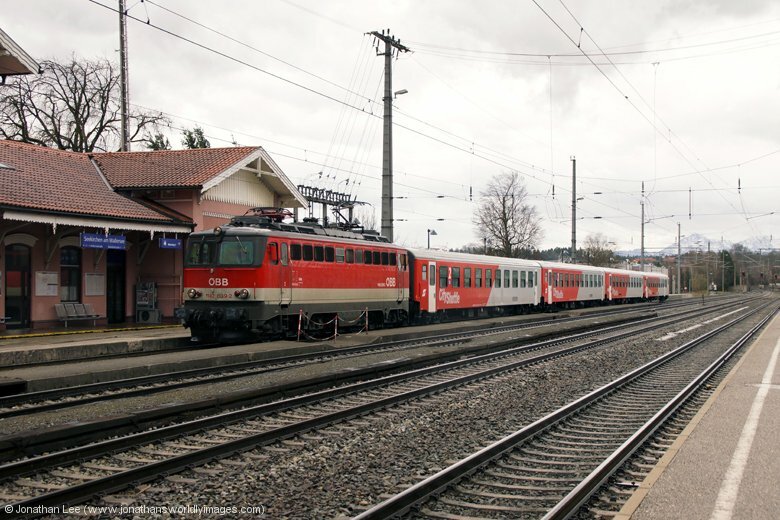 Instead I had to settle for doing one of the 2016 turns to Freilassing and back but strangely not with a 2016; 1116150 was the power for the 1607 Salzburg – Freilassing and 1624 Freilassing – Braunau am Inn, which I did out and back to Freilassing for 1142639 forward to Seerkirchen am Wallersee on REX3031 1643 Salzburg – Linz. 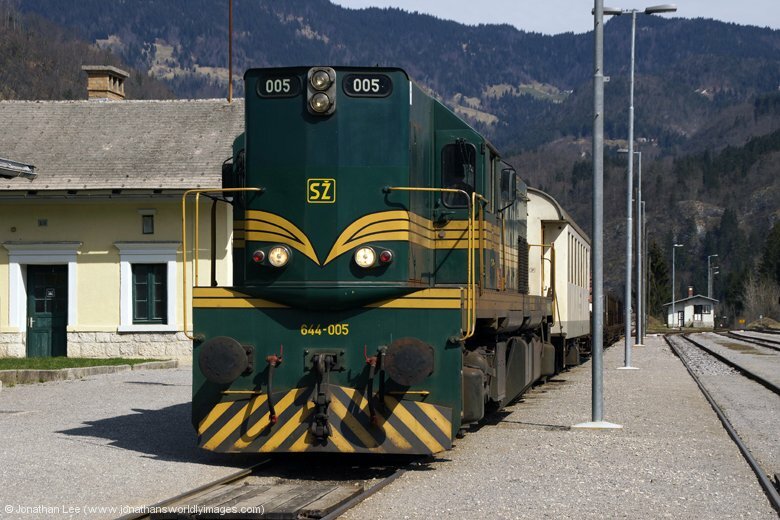 While it didn’t seem strange to see 2016069, which I’d had that morning on REX5889, heading light towards Salzburg as 1142639 made its way out of Salzburg, it was very strange what it ultimately ended up on the following morning; bizarrely finding its way onto REX5889 0616 Braunau am Inn – Freilassing, which is what 1116150 should have returned on! 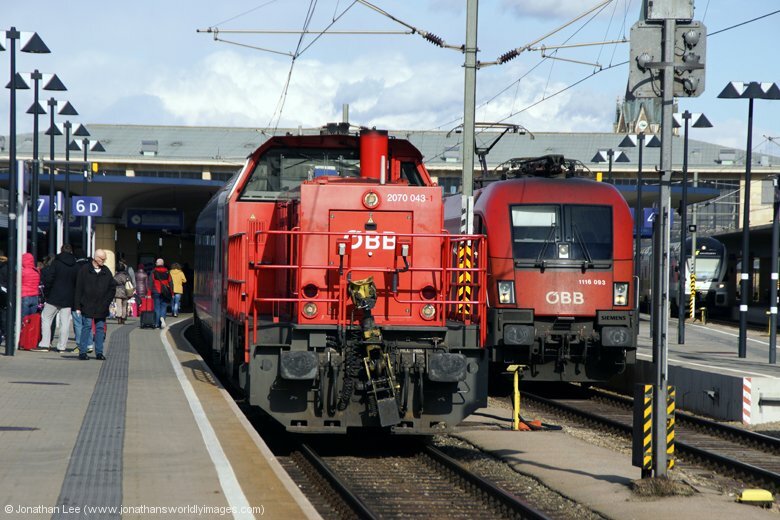 The afternoon Seerkirchen moves worked a treat with 1144019 returning me to Salzburg Hbf on REX3020 1502 Linz – Salzburg for 2016067 back out on the second Braunau turn, REX5825 1731 Salzburg Taxham Europark – Braunau am Inn and finally 1142649 back in, in pouring rain and howling wind, with REX3022 1602 Linz – Salzburg. At that point there weren’t really any other moves to do as everything turned to EMU’s so it was back to the hotel for me. 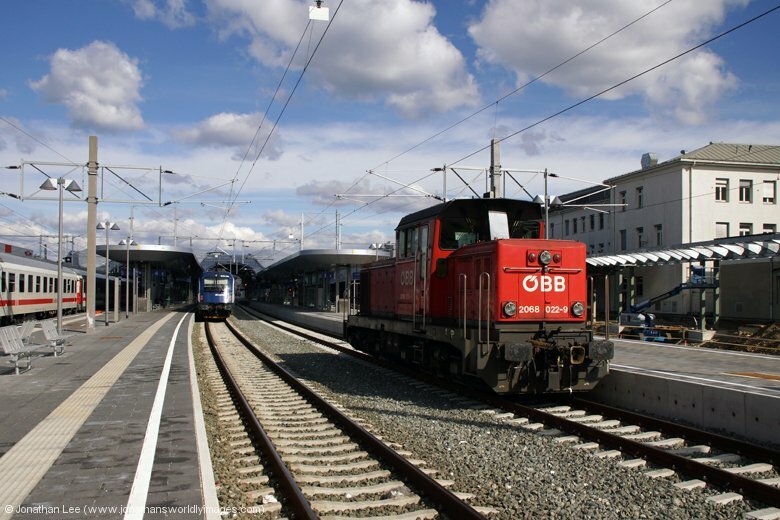 1116150 Salzburg Hbf Freilassing 1607 Salzburg Hbf – Freilassing REX5891 OBB1116 – vice OBB2016! 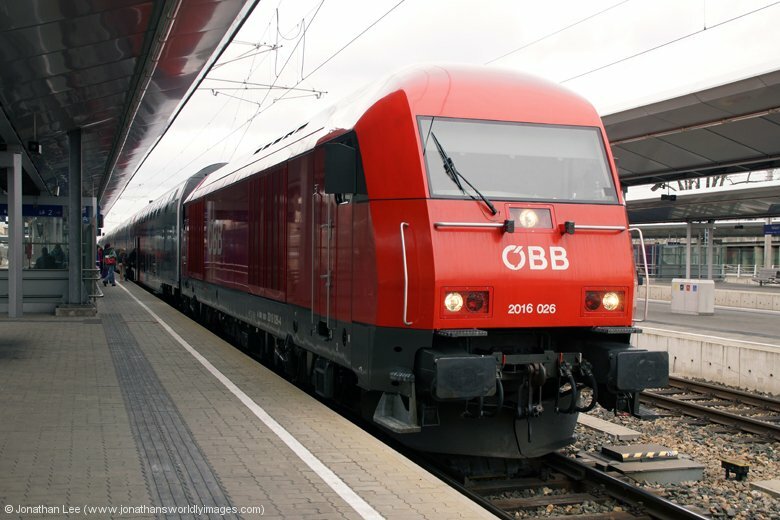 1116150 Freilassing Salzburg Hbf 1624 Freilassing – Braunau am Inn REX5892 OBB1116 – vice OBB2016! A quick spin out before breakfast, to do pretty much the same move as I’d done the previous morning, didn’t really do me any favours. 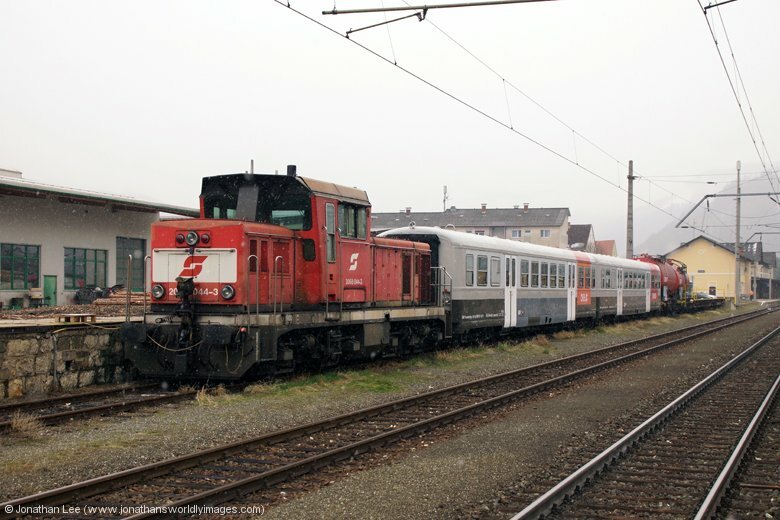 I was more than surprised when 2016069 turned up with REX5889 0616 Braunau am Inn – Freilassing; I’d been expecting a new 2016, or even 1116150 to return with the set, which was after all its diagram but to find 2016069 on it, having seen it at Salzburg shortly after 1116150 had set off for Braunau the previous evening was very strange and left me trying to understand just how it had got onto the set. Which of course was pointless as I had no clue at all. 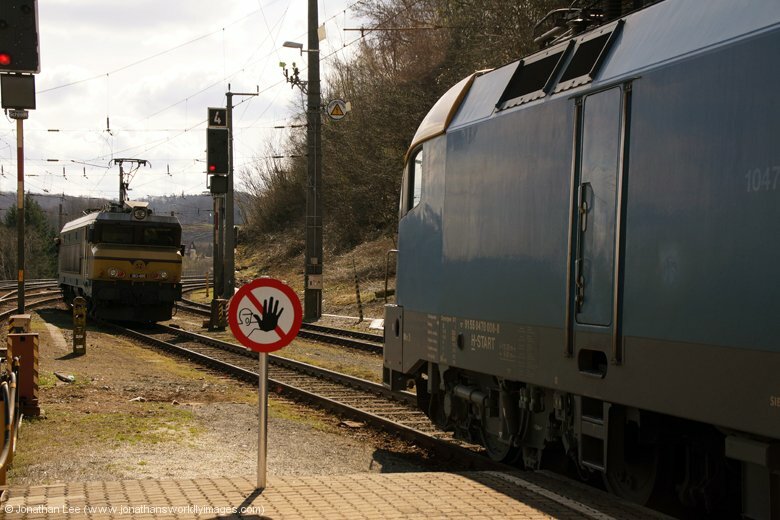 Disappointed I did it out to Salzburg Taxham Europark anyway for 1144240 back in on REX5094 0746 Freilassing – Salzburg; which I’d seen depart with REX5887 0716 Salzburg – Freilassing. It was then back for breakfast, having figured out from the platform screens which Railjets towards Vienna were double sets! 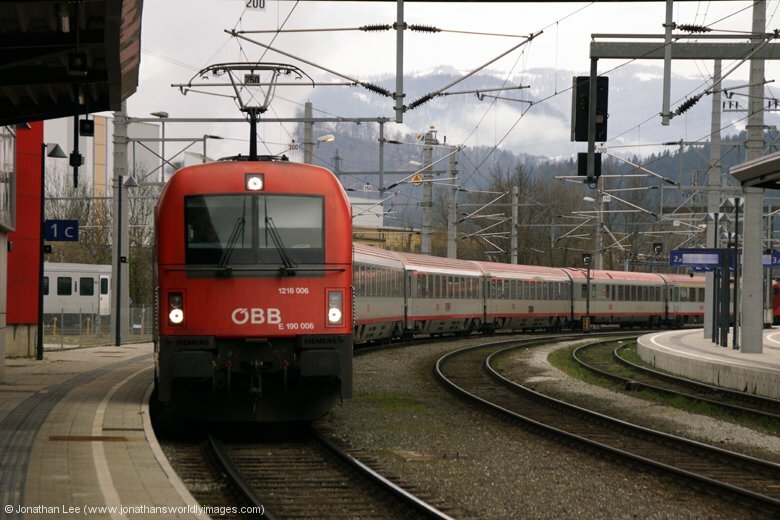 After a decent breakfast we rolled up at the station for the 0908 Railjet towards Wien but it was almost an hour late on the screens, the high winds seemingly creating havoc in the Innsbruck area overnight. 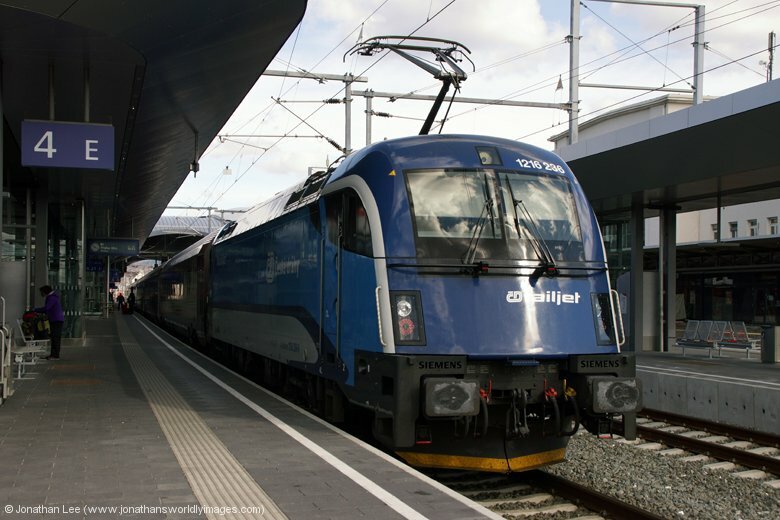 As a result we did the very empty IC549 0912 Salzburg – Wien Westbahnhof to Linz to await Railjet events behind there. 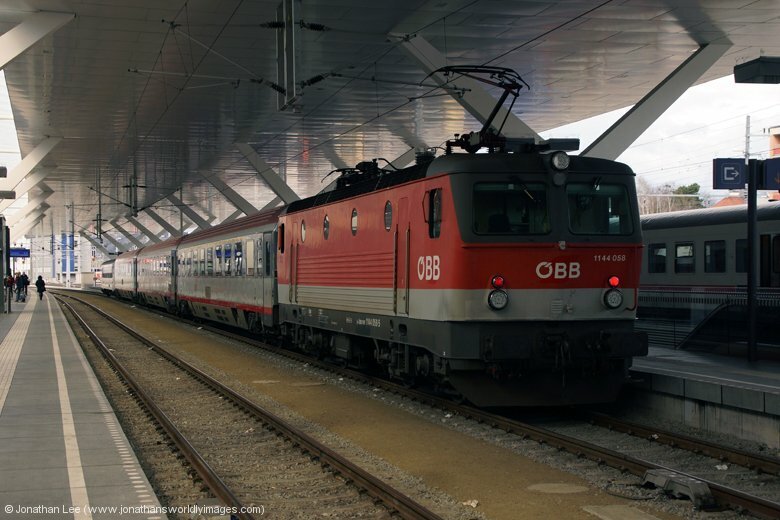 As it turned out RJ861/61, 0705 Innsbruck – Wien & 0731 Munich Hbf – Budapest Keleti combined, was a little over an hour late as it headed towards Wien but RJ765 0547 Bregenz – Wien Westbahnhof was almost right time and only a few minutes behind it at St Polten; both were double sets and all four engines, 1116249/224 & 1116245/241, turned out to be new ones so it was a successful morning. 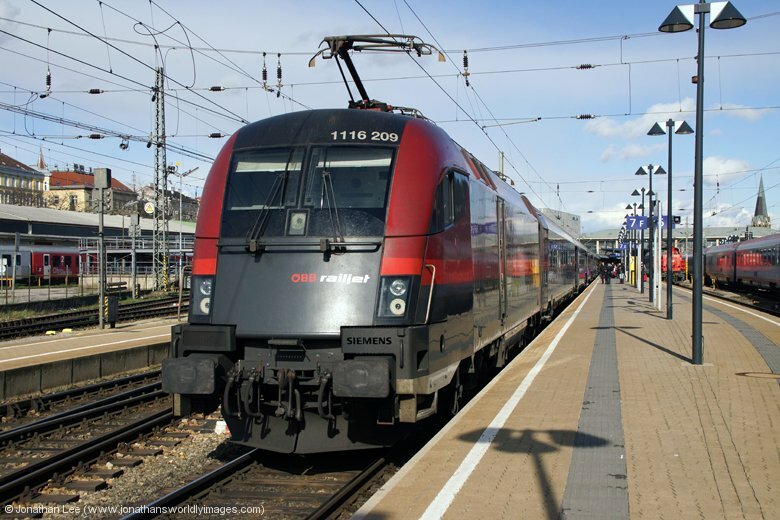 The following Railjet service from Salzburg, which we’d been planning to use from Wien Westbahnhof to Meidling, was well down the pan and over an hour late and ultimately RJ63 0934 Munich Hbf – Budapest Keleti and RJ863 0639 Bregenz – Wien Westbahnhof ran into Wien as separate trains. As a result of RJ63’s lateness we opted to get something to eat at Wien Westbahnhof before heading over to Meidling via the EMU from Hutteldorf and did REX1624 1400 Wien Westbahnhof – St Valentin out to Hutteldorf with its booked twin sets, formed of consecutively numbered 1144’s 1144260/261. 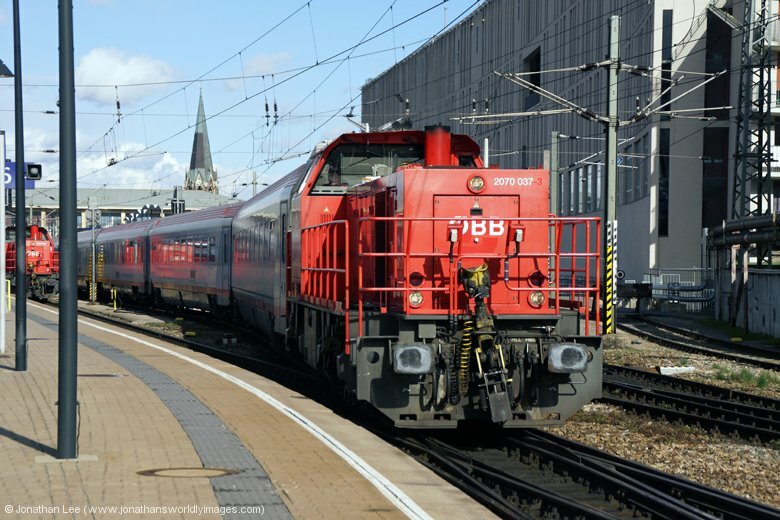 The bonus of that turned out to be us making 1144281 at Hutteldorf, which was late heading into Wien with REX1625 1207 Amstetten No – Wien Westbahnhof, which put us nicely into RJ63 0934 Munich – Budapest, which we’d seen go through Hutteldorf as we’d arrived, with 1116211; as they say, it all turned out nice in the end! 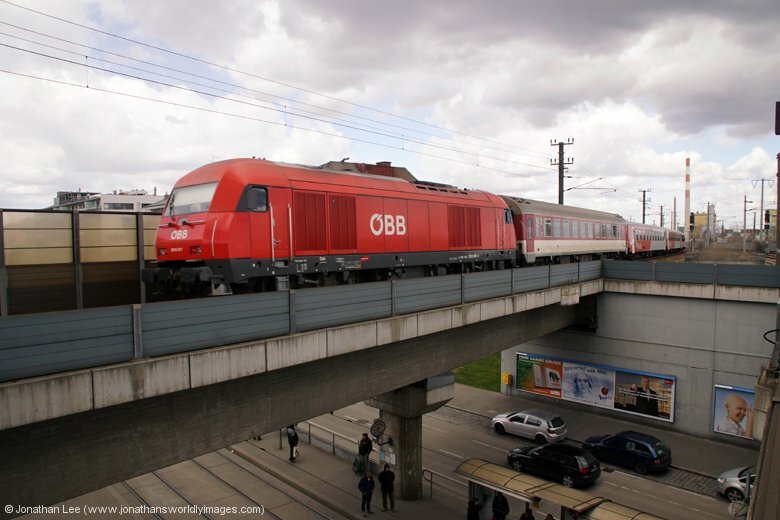 Due to the two portions from Bregenz and Munich being late OBB did the right thing and ran them both as independent trains throughout with RJ863 heading into Wien first and RJ63 some half an hour behind it. Having been delivered to Wien Mitte by 1144200 we checked into the Hilton Mitte, which is just over the road. To say I felt a little out of place at a Hilton is an understatement but it was just as you’d expect from a Hilton, pristine lobby, with good service and spotless rooms. WiFi on this occasion was provided free for our whole stay, two nights, after I joined the Hilton rewards scheme; the offer finishing that very day! After dropping our bags we didn’t stay too long and headed straight back out to visit Schloss Belvedere, which is a couple of minute’s walk from Quartier Belvedere station. The weather was a bit crappy when we got there but the cloud eventually gave way to glorious sunshine, after a bit of snow! A late afternoon in the Wien tunnels went absolutely swimmingly with everything making at Rennweg and Mitte as it should do. 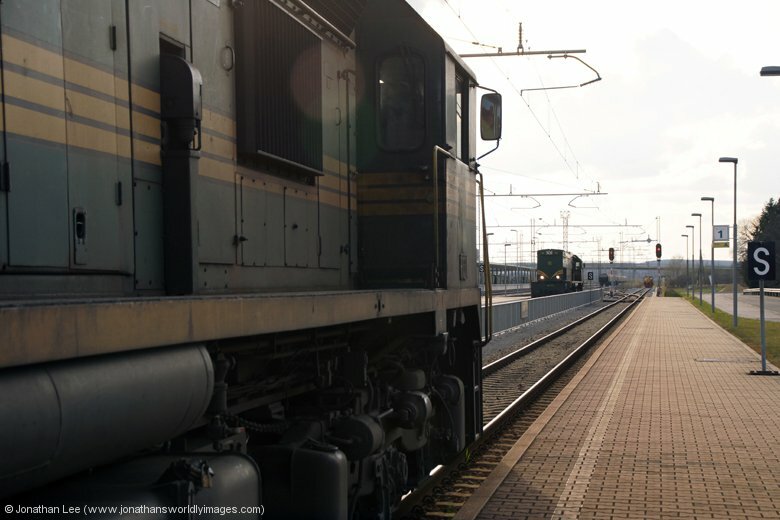 Some trains were late but when it mattered the opposing train was also late, ensure the moves made; I couldn’t have asked for a better couple of hours nedding about and having covered 14 of the turns through the tunnel I headed back to the hotel to prepare for an evening out. Having eaten in Vienna before we decided not to go anywhere else as the food had been good at Restaurant Fratelli, which is just round the corner from Stephansdom. The pizza’s we had were as good as they had been on our previous visits and the service was good too, with English speaking waiters. The off-putting moment was when I signed the credit card bill, the waited walked off with it then abruptly turned round half way back to the till and came back with the receipt to ask, in a not very pleasant tone and off-putting manner, if there had been anything wrong with the meal. Apparently as I’d not put a tip on the bill he assumed there was something wrong and challenged me about it; after that there was no way he was getting a tip either and I couldn’t get out quick enough! Europeans should really understand that the British aren’t good tippers and generally always leave cash anyway; if they want to! Despite the minor but annoying incident the food was good, as was the service, but I’d already made my mind up we’d be eating elsewhere the following night. Before breakfast I nipped out to see how many of the remaining diagrams I could cover through the Vienna tunnels that morning; I think there are about 23 in total so I had plenty to go at. With not having figured out what should be where I just played it by sight and in the 90 minutes or so I was out I managed to pick up 4 more of the turns, two of which were the 1116 turns. 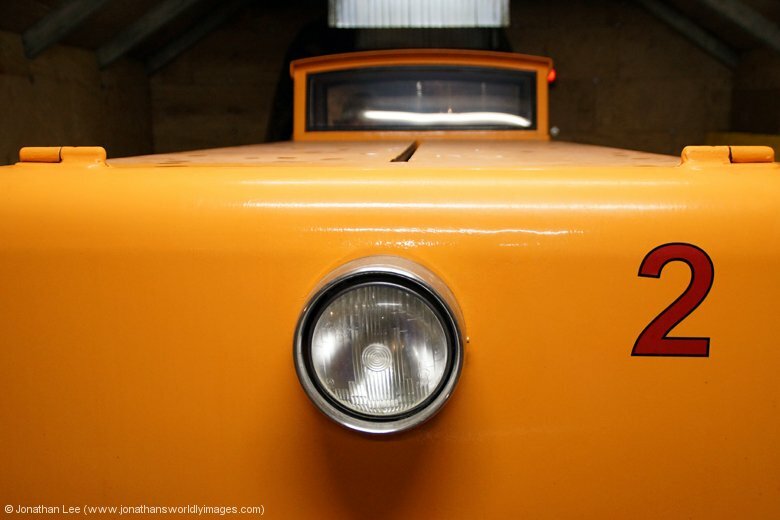 Having not seen an 1142 on anything the previous night I wasn’t surprised to not find one on this morning either. With nothing much planned we wanted to return to Schloss Schonbrunn again and had been hoping for some decent weather to do so but were sadly disappointed as it was completely overcast with miserable grey skies! Still we didn’t let the weather beat us and decided to head out there anyway. 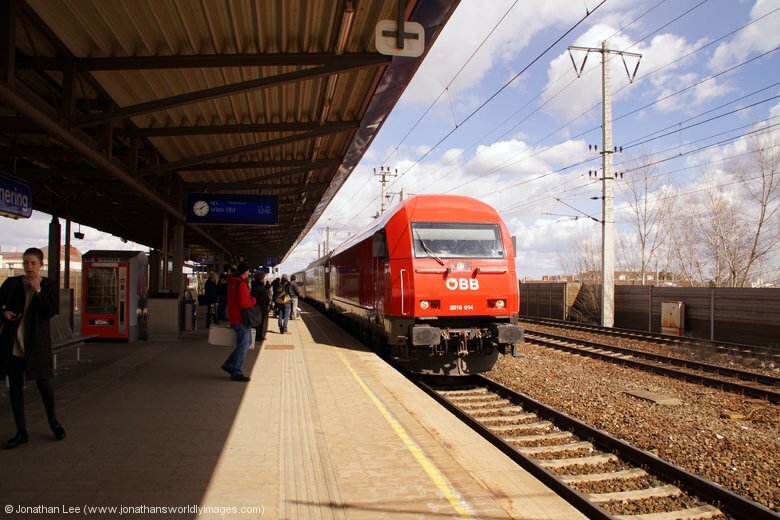 As we were ready earlier than expected a few bonus moves preceded our afternoon out which included 1142609 from Praterstern to Wien Hbf on REX2319 0906 Floridsdorf – Wiener Neustadt then a couple of moves from the Hauptbahnhof to Meidling, which included 1116197 & 1116100 on Bratislava turns, CD’s 380008 on D101 0652 Bohumin – Wien Westbahnhof and MAV 470004 on EC142 0526 Debrecen – Wien Westbahnhof; the latter delivering us to its destination. 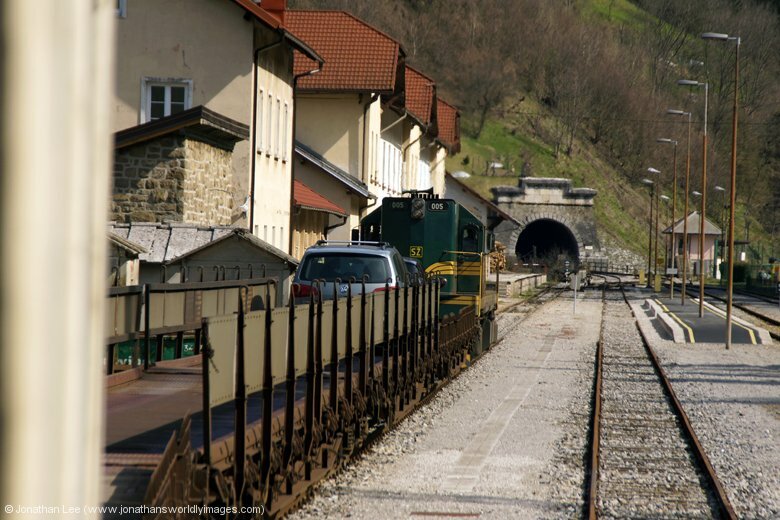 Our way of getting to Schloss Schonbrunn was to do walk from Wien Penzing station and having done 1144289 out to Hutteldorf on R2020 1118 Wien Westbahnhof – St Polten for 1144285 back to Penzing on R2023 1037 St Polten – Wien Westbahnhof we set about walking, with ME maps showing the way on the phone. You can actually see Schloss Schonbrunn from the train as you pass by Penzing station and it doesn’t look too far, in essence it’s a steady 15 to 20 minute walk. 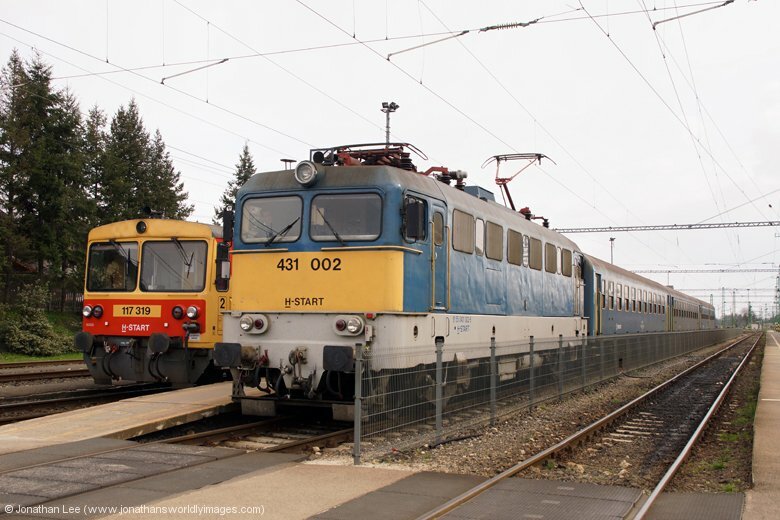 After walking back to Penzing station an out and back move to Tullnerbach-Pressbau was available which revealed 1144275 with R2026 1318 Wien Westbahnhof – St Polten and 1142637 on the return with REX1625 1207 Amstetten – Wien Westbahnhof, which despite being a little late still made IC693 1112 Salzburg – Wien Westbahnhof; already sat in with 1116084. This dropped us into Westbahnhof with a bit of manufactured time to spare and lunch was consumed from the pasta place on the concourse while watching how the other half live! Unfortunately a lot of the seating area, to eat at, was taken by a group of eastern Europeans, as it had been the previous day when we’d eaten there, who’d clearly just arrived into Austria. The difference from the previous day was that what appeared to be a handler was sat with them, dishing out some gen and handing out sim cards to them all; I can only assume they’d be moving on at some point that day to digs and were being told where to get jobs, etc, etc. Meanwhile, after the handler left, they just continued drinking and being generally loud! Not the greatest of atmospheres to be eating around and I have to say I was surprised that the station security staff didn’t move them on. 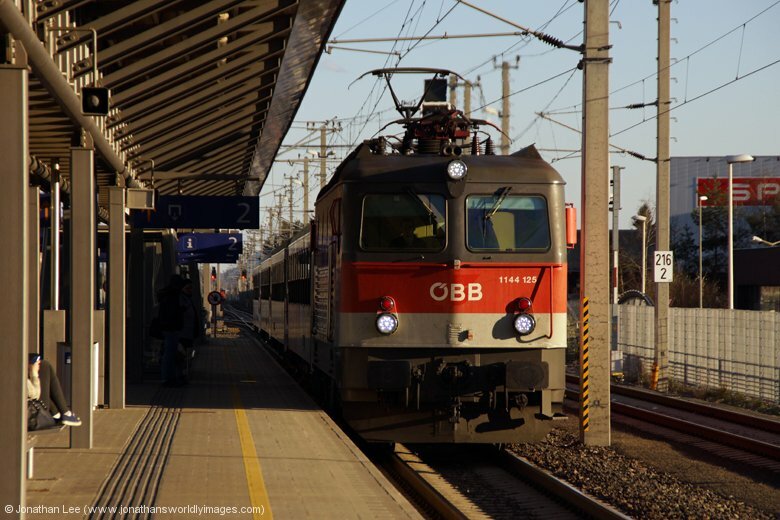 Fed and watered, back on the station, 1016004 had dropped onto the same set we’d arrived on to form IC692 1456 Wien Westbahnhof – Villach Hbf, which we did out to Hutteldorf to then catch a local Hutteldorf – Bruck a. d. Leitha EMU round to Meidling; we’d been at Westbahnhof at the wrong hour to be able to get an IC or Railjet service round to Meidling. 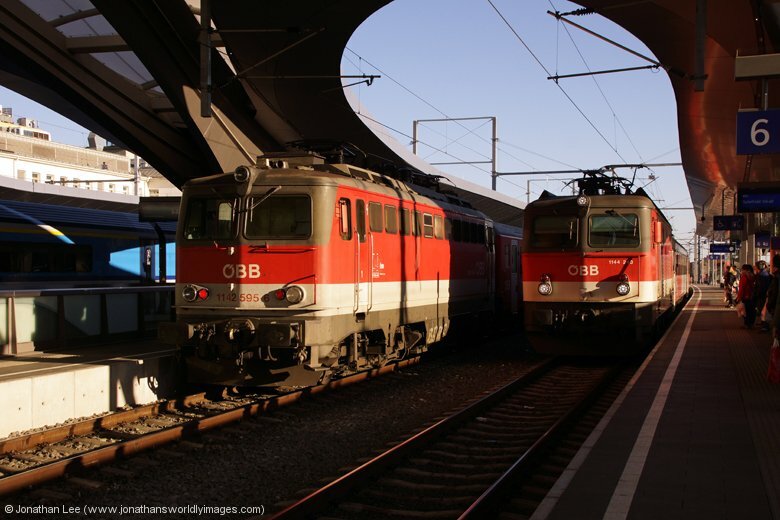 A few moves between Meidling and Hauptbahnhof, the plan being to cover both Railjet services that got two engines in the afternoon, RJ631 1622 Wien Hbf – Villach revealing 1116261/1116248 in multi on the front of the train (it being booked an OBB 1116 to top the train), and RJ538 1314 Villach – Wien Hbf turned up with GySev 1116063 leading and 1116225 on the rear (it being booked a GySev 470 to T&T the train). 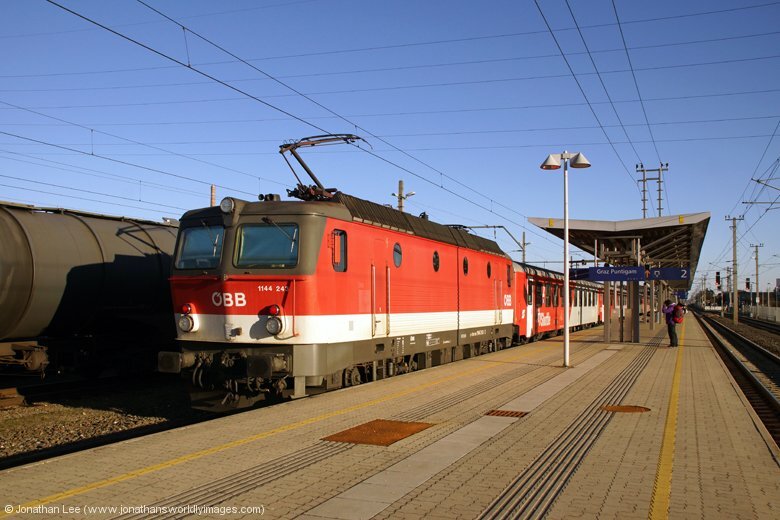 1216237 looked the part as it worked through with RJ77 1242 Praha Hl Nadrazi – Graz Hbf and the only thing that was possibly out of the ordinary was 1142673 which worked D459 1641 Wien Hbf – Murzzuschlag. 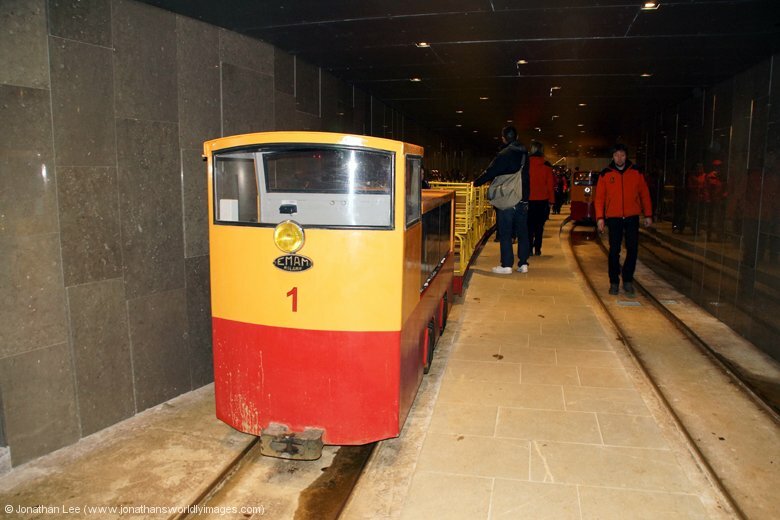 Having had two decent evenings out doing the Wien tunnel spin about I didn’t even temp fate on this evening as there shouldn’t have been much left for me to pick up anyway so it was more or less straight back to the Hilton for an amble towards town to get something to eat. Prior to all the above I got myself out of bed early to nip over to Wien Franz Josefs to do the morning rush hour. Having ploughed through the diagrams the previous evening to figure out what was available I’d scribbled down a very rough ready-reckoner and figured out that there should be 16 turns to cover, which of course weren’t all available in one peak; covering both the morning and afternoon peaks gave a fighting chance of that, which I wasn’t going to do. 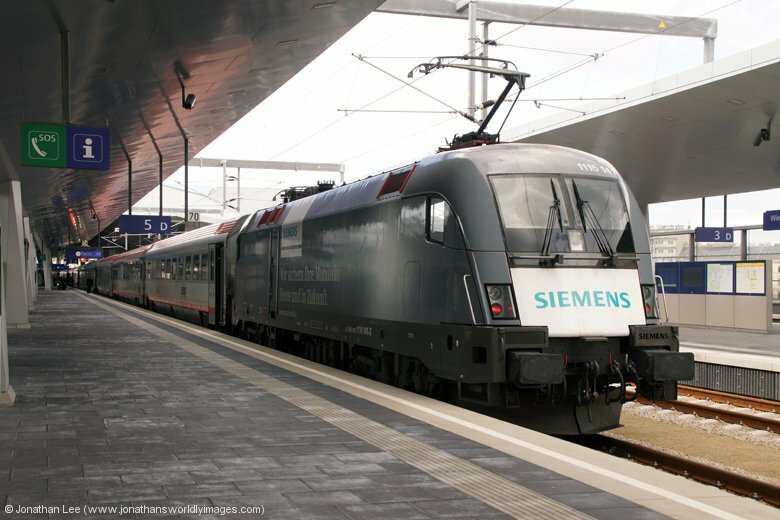 There were 8 x 1142 turns and 4 each for 1144 & 1116 and I departed Wien Mitte, with the bonus of 1144073 on the 0520 Wiener Neustadt – Bernhardsthal, to see just what I could get in during the inbound rush. At Handelskai I walked down the stairs to the platforms that serve the Handelskai – Hutteldorf route and didn’t have long to wait for EMU 4024140 to take me the short distance to Heiligenstadt, on the 0628 to Hutteldorf; where I literally stood on the platform freezing cold in the biter morning air! Things didn’t get off to the best start when 21007 rolled in with an EMU vice 1116 but from that point on, thanks to a little lateness things only went uphill. 1144213 starting proceedings off with REX2167 0529 from Sigmundsherberg, which I did all the way to Spittelau for one of only three loco-hauled departures from Franz Josefs that morning back to Heiligenstadt; 1144067 with REX7104 0651 to Krems a. d. Donau. 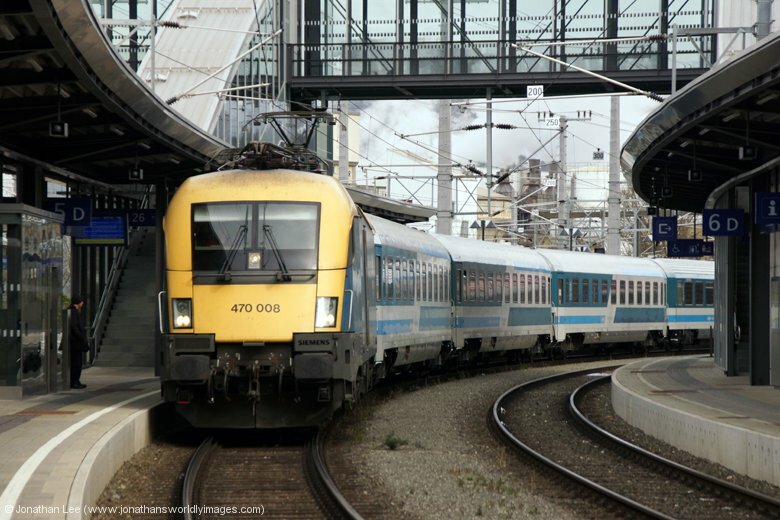 One of what turned out to be only two 1142’s was just rolling in when I got back, 1142626 heading R2169 0534 from Sigmundsherberg and when this made the EMU on the 0702 ex Franz Josefs at Spittelau I knew I had time to get back to Heiligenstadt for REX7105, the 0601 ex Krems a. d. Donau; which was again just arriving as I was and had 1144203 at its helm. 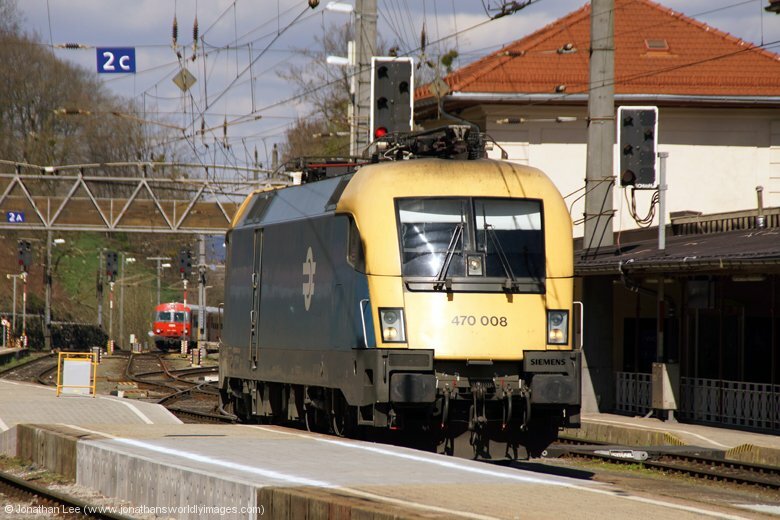 I could then get off again at Spittelau and wait for, what turned out to be, 1144064 behind with REX7107 the 0614 ex Krems a. d. Donau. 1116038 headed up R2102 0727 to Ceske Velenice and put me nicely into the only other 1142 to produce that morning, 1142691, at Spittelau working R2105 0531 ex Gmund No. 24 minutes after my previous departure I was leaving Franz Josefs again, this time with 1144006 on REX7106 0751 to Krems a. d. Donau. This put me into a step off move into Franz Josefs involving 1144043 & 1144205 with REX7153 0644 ex Krems a. d. Donau and R2173 0643 ex Sigmundsherberg respectively. Back at Franz Josefs I was about to call it a day and wait for an EMU back to Heiligenstadt and return to Wien Mitte via the same route I’d come out. 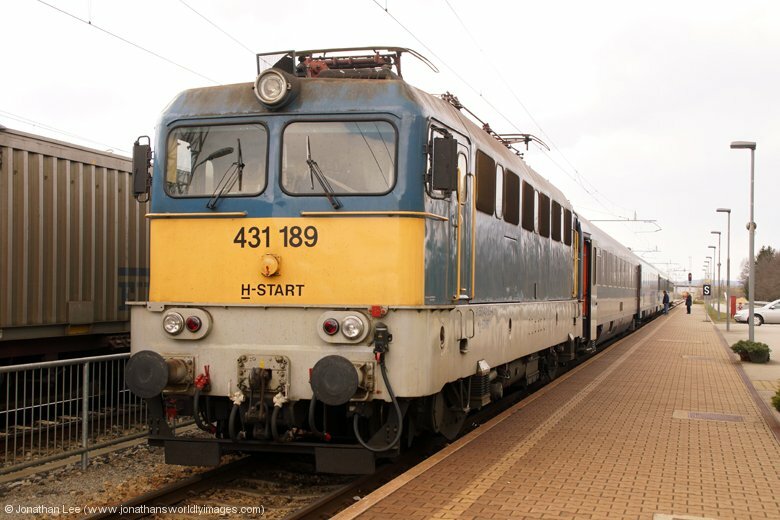 Having figured out where the Metro was on my ME map app, basically out of the station front, turn left and about 300m straight ahead on the left, I found myself compelled to do the U4 the three minutes it took to Heiligenstadt to do a second step off move back into Franz Josefs with 1144212 & 1116183 with REX7109 0726 ex Krems a. d. Donau and R2107 0619 ex Ceske Velenice. I then walked back to the Friedensbrucke U4 stop and did the metro back to Landstrasse and walked over the road to the Hilton for breakfast, arriving no later than I would have don had I done the train back vice the metro. Each metro ticket cost €2.20, the latter journey only taking 6 minutes! Breakfast seemed a little busier than it had been the previous morning at the Hilton yet it was still relaxing to have the space around and not be crammed in; then again I was glad to get out and away from the hustle that seemed to surround a business person’s life style. With a bit of time to kill before we needed to be Graz bound we headed to Stephansdom to have a look round. 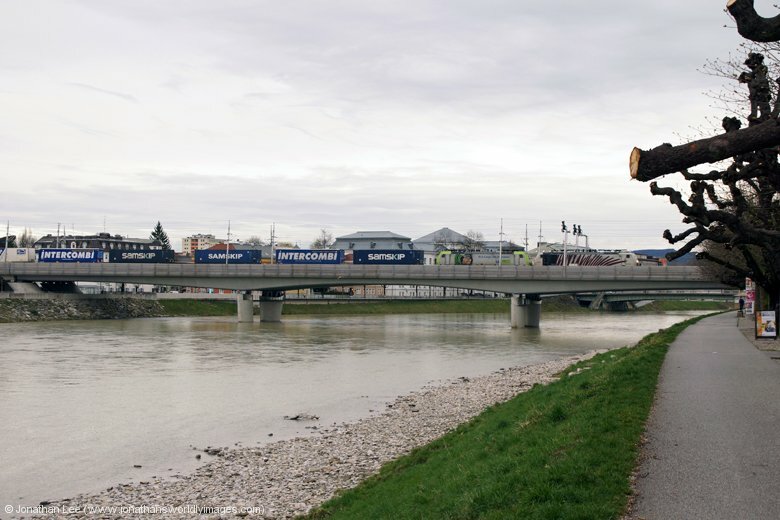 1144037 took us round to Wien Hbf on REX2331 1206 Floridsdorf – Payerbach Reichenau, where a few ned leaps occurred before our planned 1422 Wien Hbf – Villach Railjet, which was booked two locos. 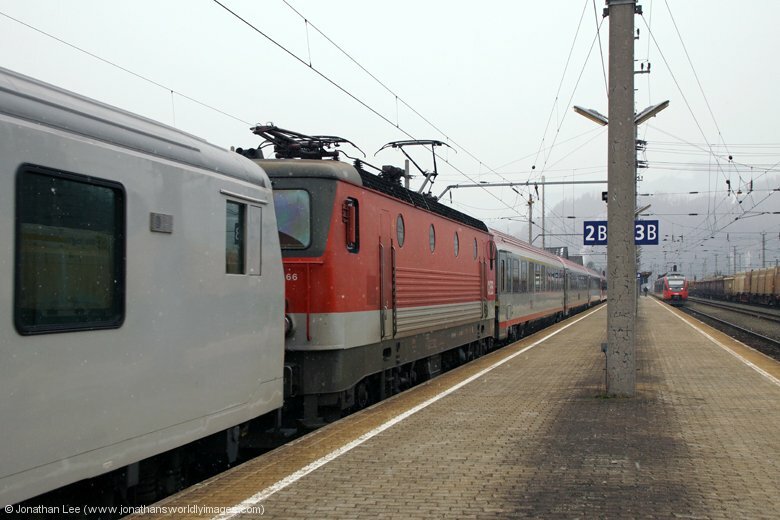 Two initial trips to Meidling preceded dinner with 1116148 for 1116113 on REX7614 1130 Bratislava – Deutschkrutz & REX7623 1128 Deutschkrutz – Bratislava respectively; 1116148 seemingly having swapped diagrams from the previous day. 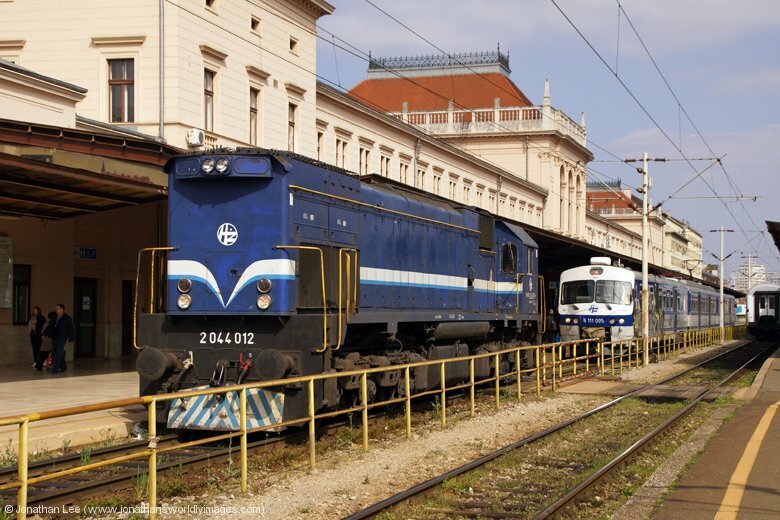 Thanks to a bit of lateness with the Praha railjets a bonus move presented itself with 1216’s painted in CD livery; 1216234 with RJ73 0842 Praha Hlavni Nadrazi – Graz and 1216236 with RJ76 1025 Graz – Praha Hlavni Nadrazi; then dinner was sought downstairs. 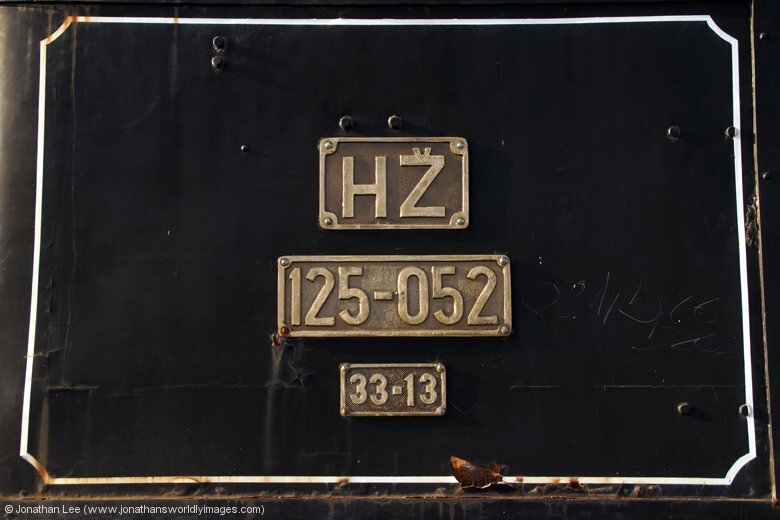 A very good Chinese takeaway was located and the food consumed on board RE2518 1321 Wien Hbf – Bratislava Hlavni Stanica while waiting for it to depart with 2016007 on the rear. 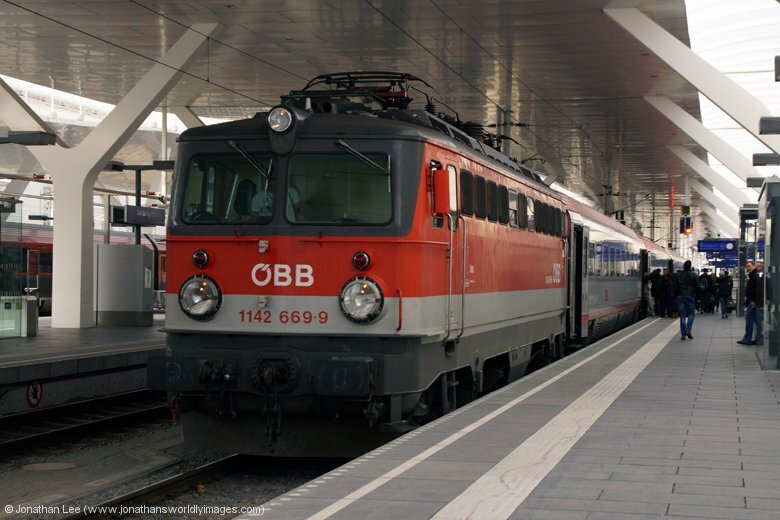 It was ultimately done the short distance to Wien Simmering for a short wait, where 2016014 presented itself with RE2519 1243 Bratislava Hlavni Stanica – Wien Hbf. Back in Wien Hbf 1116233 was sat with RJ657 1355 Wien Hbf – Graz and 1116243 was sat with RJ539 1422 Wien Hbf – Villach; the latter was top & tailed with OB 1116141 on the rear. Having decided to do 1116233 to Meidling I was pleased to find 1116207 just arriving, as we did, with RJ63 0522 Frankfurt Hbf – Budapest Keleti; running a bit late. This extra bonus meant we could get back into Wien Hbf and get ourselves some seats on board RJ539 before it departed. The Railjet part of RJ539 was pretty wedged yet the conventional stock portion at the rear, which 1116141 was attached to, was pretty empty and made for a nice relaxing journey through the Semmering Pass, where plenty of snow covered the ground and the sun beamed down; it’s well worth a run over this bit of line just for the scenery. At Bruck an der Mur we got off to do a few moves on the Graz hauled sets, which are replaced by EMU’s over the weekend, so as it was Friday it made sense to do so then! 1144007 was just coming into the statin when we walked down onto the platform, to form 4085 1638 Bruck – Graz and 1144056 arrived shortly afterwards with 4084 1532 Graz – Murzzuschlag, which sits at Bruck for a while to wait connections. 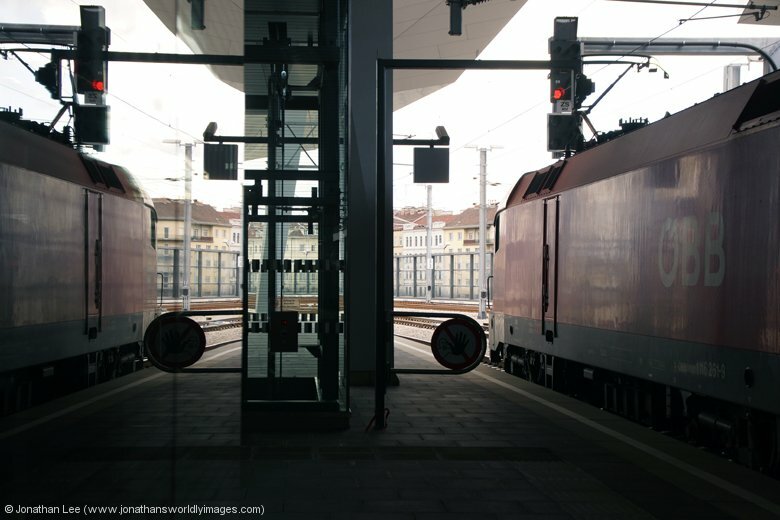 Moves on the Graz – Bruck section are quite good but there are a few tight pluses that need to be made to ensure the next move makes; the good thing about the section is that stations are island platforms so only a few seconds is needed to make the plus! 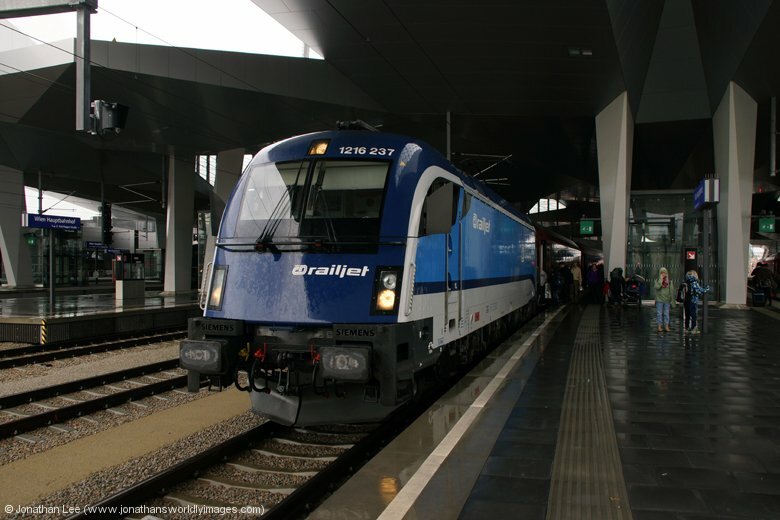 Our plus at Frohlieten was comfortable and 1144109 arrived promptly with 4086 1635 Graz – Bruck. Rather than go for the tight plus at the next shack we opted to get off at Mixnitz and wait. 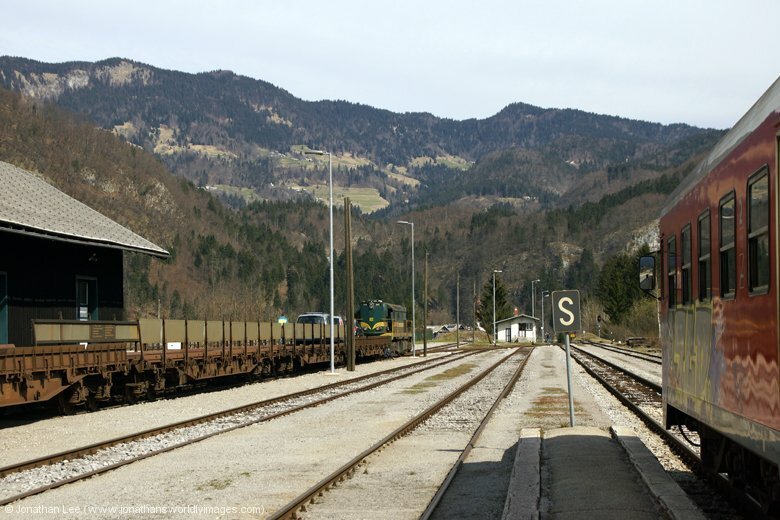 Over the way from the station is the Brietenauerbahn, who operate predominantly freight trains over a narrow gauge electrified railway with heritage locos. 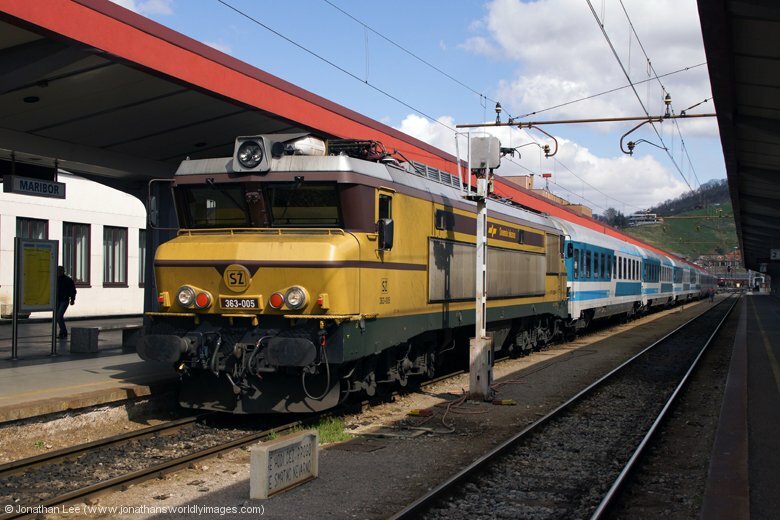 On certain weekend during the summer months they do operate passenger services, which I managed to do when they celebrated 100 years of service during 2014. 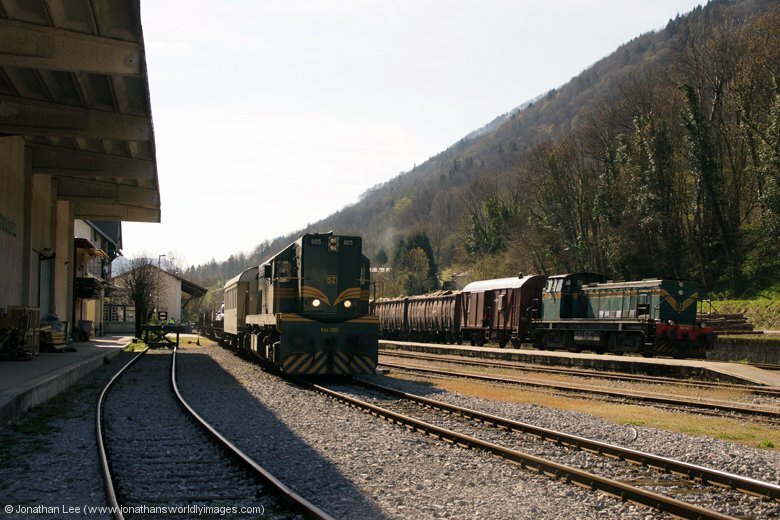 On this occasion there was no life at all by the loco shed, or in the yard, and it seemed that all 4 locos that the Brietenauerbahn owns were tucked up in the loco shed. 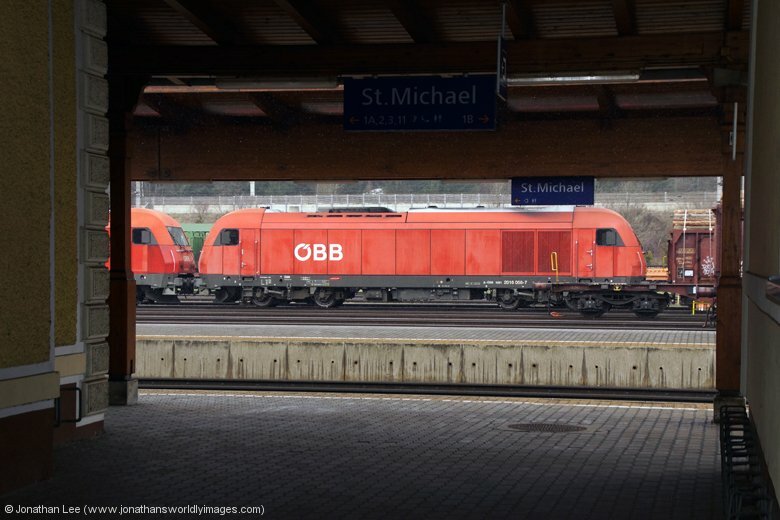 Shortly before 4035 1708 Bruck – Graz arrived 1142623, still in old OBB livery, headed through going towards Bruck ecs, then the surprise of the afternoon rolled in as 1142598 & 1142595 plus their sets formed 4035 1708 Bruck – Graz. While the train was booked double sets it was booked for 1144’s so I was quite pleased with what turned up. 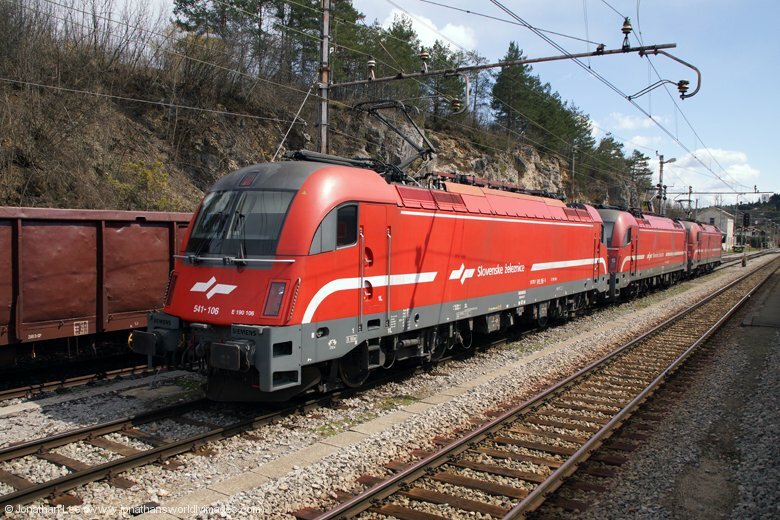 On arrival at Graz the sets were split with 1142595 forming 4030 1805 Graz – Bruck and 1142598 forming 4090 1835 Graz – Bruck, as booked in the diagrams. 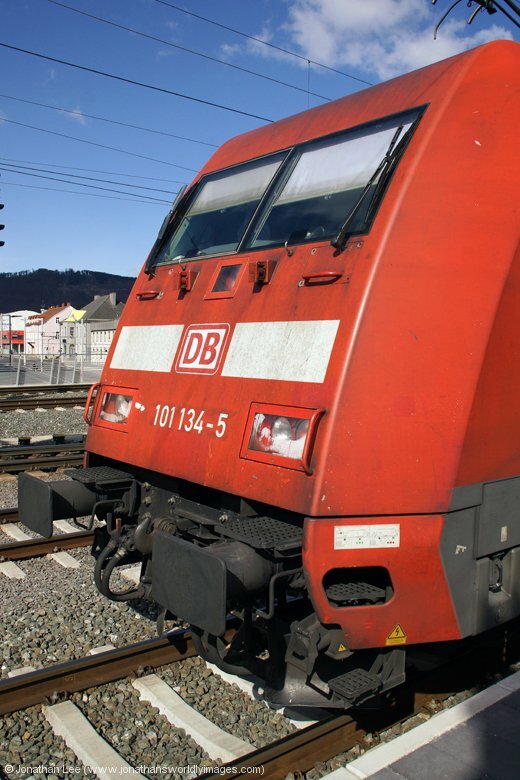 As we sat on 4145 1808 Graz – Spiefeld Strass, with 1144243, I noticed 1501.001 departing with what I later figured out to be GKD train 8427 1804 Graz – Koflach; at that point I hadn’t even realised GKD operated from Graz and ultimately figured out after looking at their timetable that there wasn’t going to be any loco-hauled trains at a weekend! After a short fester at Graz Puntigam 1144125 deposited us back into Graz Hbf on 4148 1739 Spiefeld Strass – Graz. 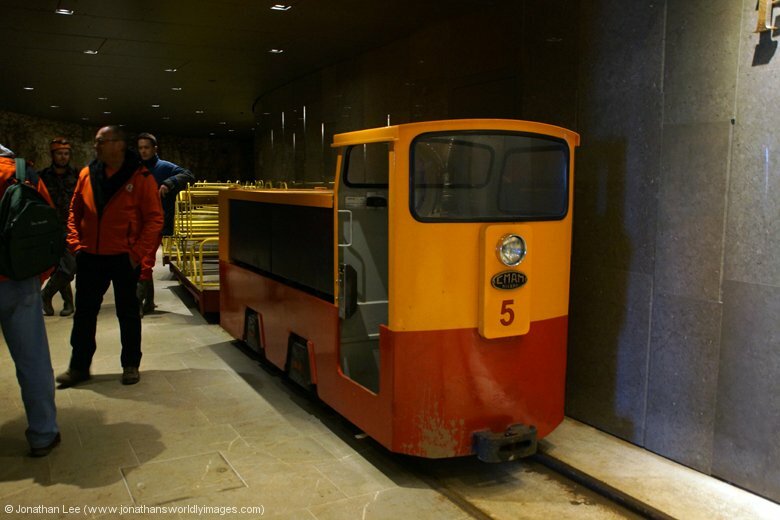 The Ibis Graz is literally over the road from Graz Hbf and only a minute’s walk as a result. Check-in was easy enough, once the group in front had got out of our way. It appeared they were on some sort of boozy weekend and I’d noticed their room number when they were handed their keys. As we were given a room very close to them I asked to be moved when our key was handed over and the girl at reception fully understood why I’d asked and even joked with us about it; maybe I’d been wrong in my thinking when we’d left the Hilton in Vienna that morning? 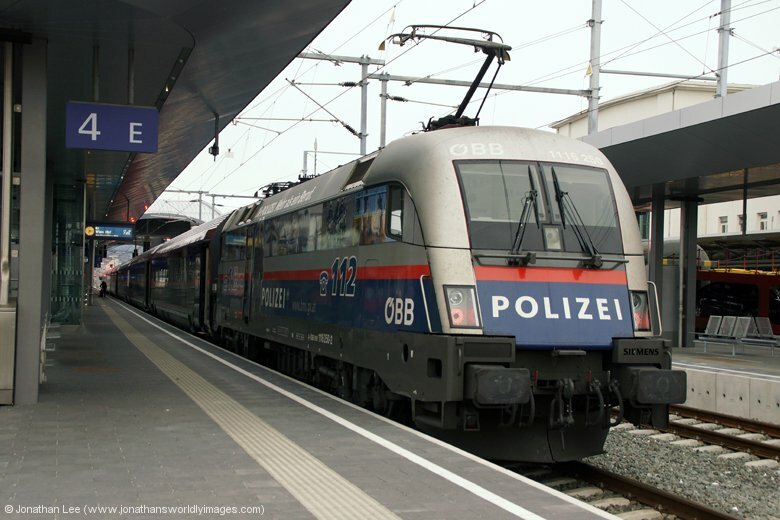 With there not being much on offer train wise in Graz on a weekend I managed to figure out a move to St Michael and return that involved 6 trains, starting on RJ554 0725 Graz Hbf – Wien Hbf, which was headed by Railjet engine 1116250; painted in Polizei livery! 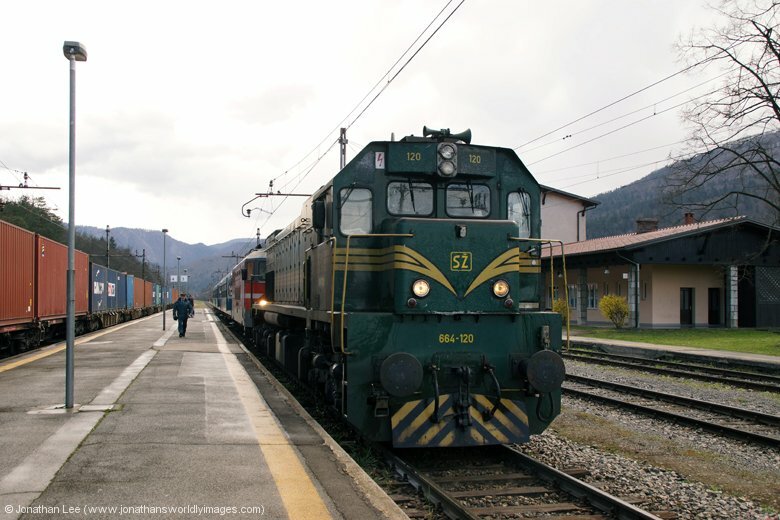 The original idea had been to do IC502/512 0745 Graz – Linz/Salzburg to St Michael but then I realised I could do RJ554 to Bruck for EC31 0622 Wien Hbf – Venice to Leoben for IC502/512 forward; the latter going straight round the curve at Bruck and avoiding it completely. 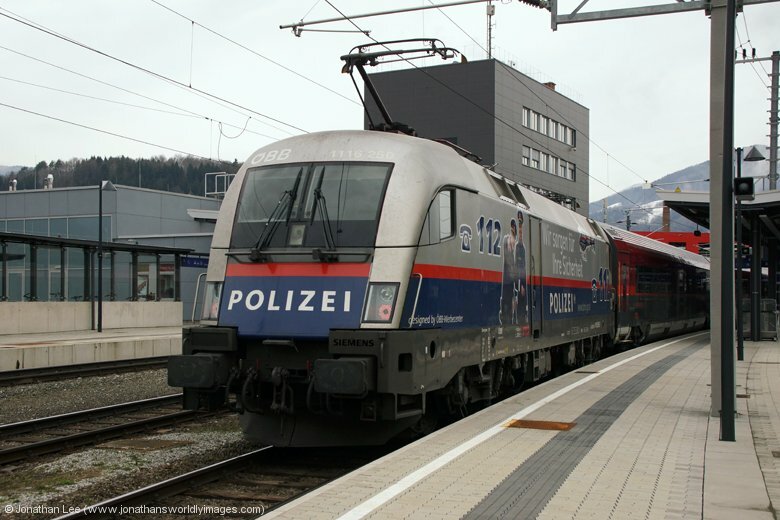 When EC31 ended up 10 late I feared I may miss the IC’s at Leoben but EC31, led by 1216006 with Railjet 1116235 in the middle of the train, pulled in alongside IC502/512 at Leoben, which had 1144082 leading the Linz set and 1144066 leading the Salzburg set. The crew were on the platform directing people to the correct set and EC31 departed first anyway so there was no rush. As I alighted at St Michael it was snowing and bitterly cold for the time of year. 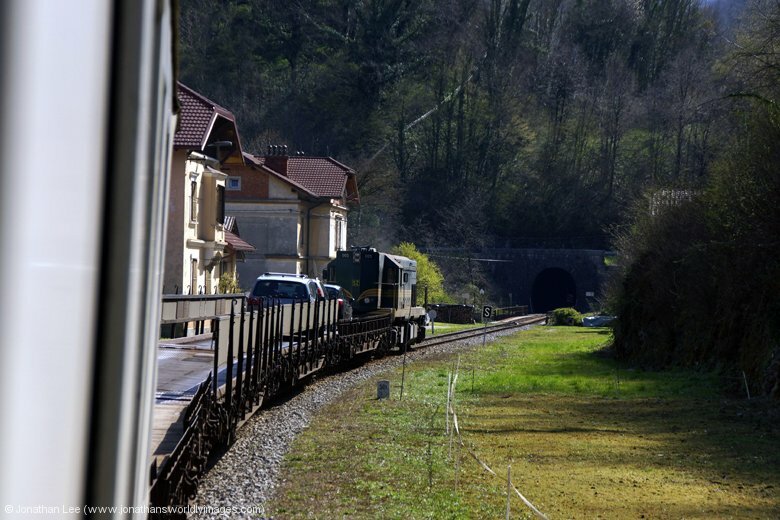 There were a couple of 2016s in the adjacent yard preparing to work what appeared to be a load train of logs towards Bruck and the tunnel rescue train was sat in the bay with 2068044 plugged into the shore supply to prevent its batteries going flat. 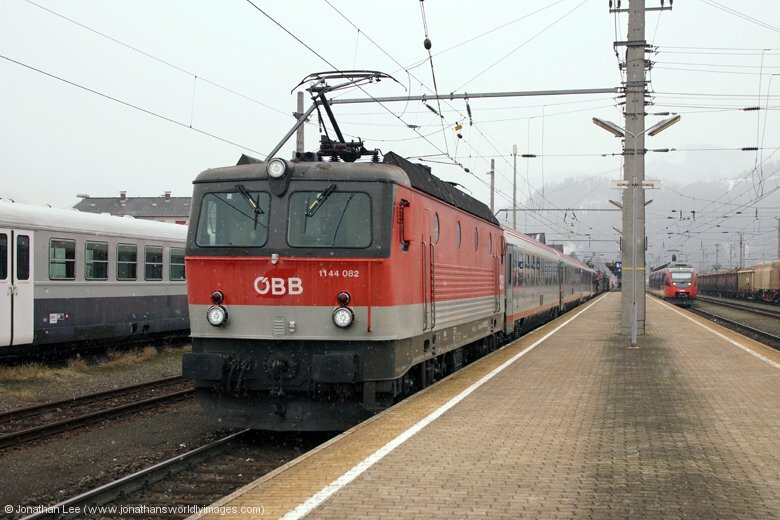 I passed some of the time with a walk to the supermarket in the station car park but ultimately ended up waiting in the cold for DB 101050 to arrive out of the gloom with IC719 0615 Salzburg Hbf – Graz Hbf and as I alighted at Leoben I walked straight into John Sandam with enough luggage to keep him going for the rest of the year; although now he’d retired maybe that was his plan……? 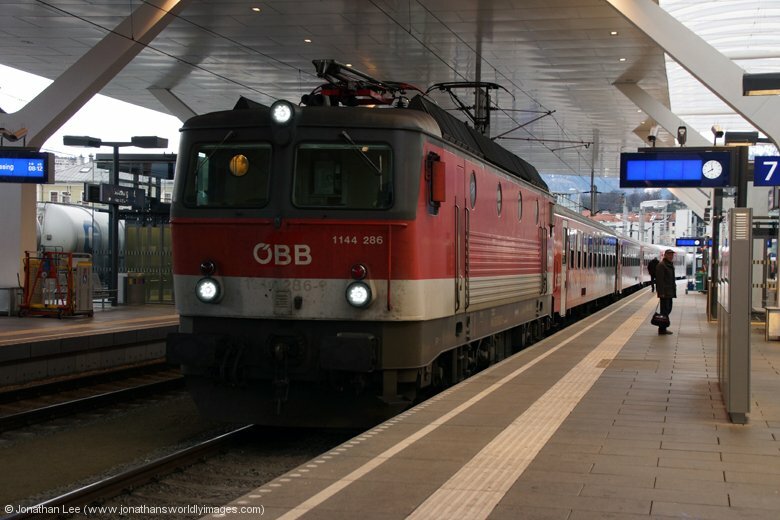 It turned out that Sandam had stayed in the Ibis at Graz the previous night and done IC502/512 out that morning to Leoben and flagged 1216006/1116235 and just waited there for 1116248 coming back with RJ532 0714 Villach Hbf – Wien Hbf, which we both did to Bruck and then Sandam left me be when randomly MAV 470008 turned up with EC151 0755 Wien Hbf – Ljubljana; vice 1144! Oursightseeing that morning started with a walk into Graz. Below the Schlossberg there is a series of tunnels which were used as shelter during WWII and are now used to operate the “Fairytale Railway” which is basically a train ride for kids through the tunnels and unfortunately offers no insight into the pains and perils faced by those that used it during the war. 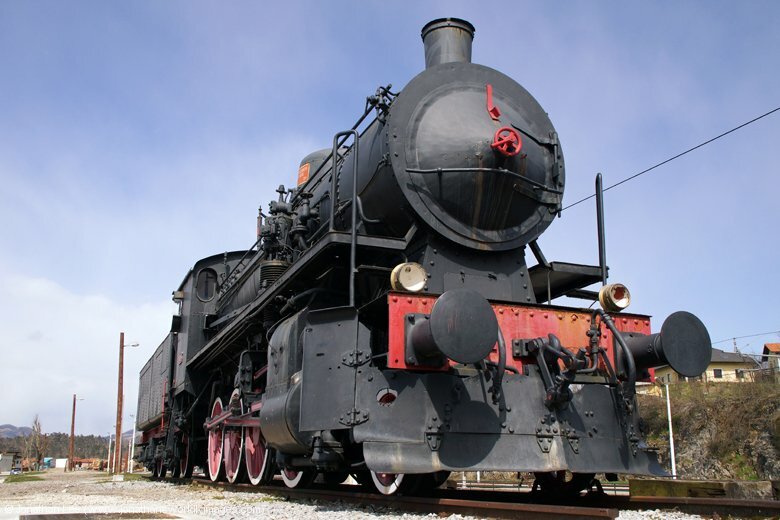 Tickets cost €8.50 per adult but there are deals for families. 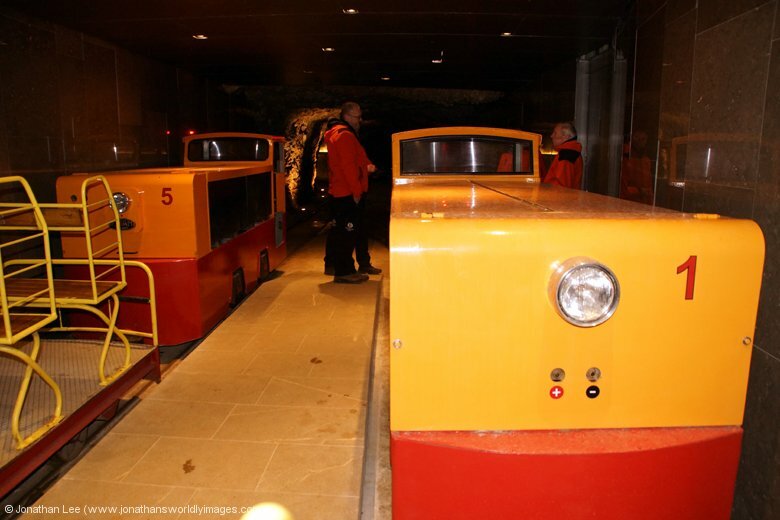 When we asked for ours the guys serving actually queried whether we wanted to do the Fairytale Railway as the entrance to the glass lift that takes people up to the clock-tower is through the same entrance! From a railway tunnel under the hill we walked down the road to the station for the Schlossbergbahn, which is where the funicular railway runs up the hill to the Schlossberg itself. 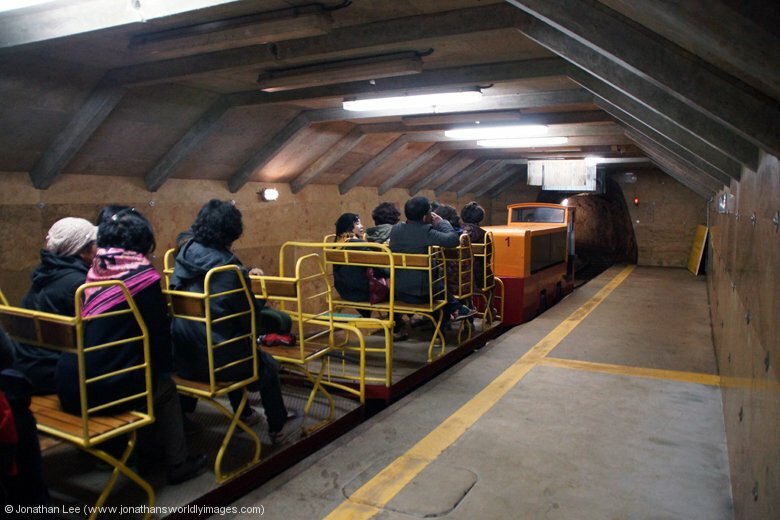 Tickets cost €2.10 each for a single journey with slightly better rates for return trips. The cars themselves are nothing more than a glorified glass box but they do offer great views over the city as they ascend; unfortunately the city isn’t that spectacular to look at all. With an afternoon to kill it would have been rude not to do the complete Graz experience and have a look at the Schloss Eggenberg, which is on the opposite side of town to the Schlossberg but with the Ibis being about equidistant between the two it made things a bit easier. While there are busses and trams to get you to the Schloss Eggenberg it only took us about 15 minutes at a steady pace to walk it; from effectively Graz Hbf. 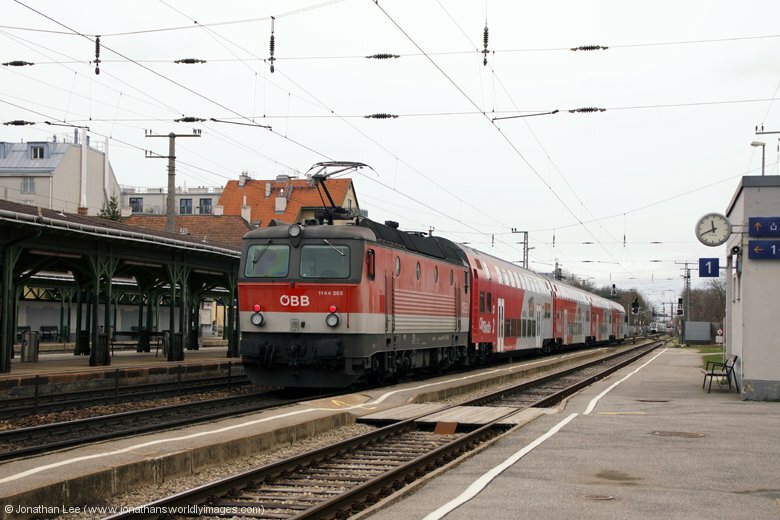 1144082 Leoben St Michael 0745 Graz Hbf – Linz Hbf IC502 OBB 1144082 lead, OBB 1142066 mid train; in multi. 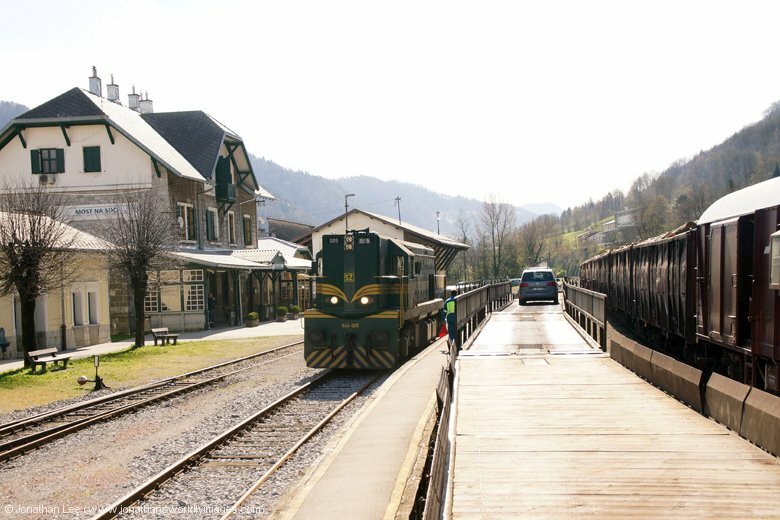 Trains split en-route. 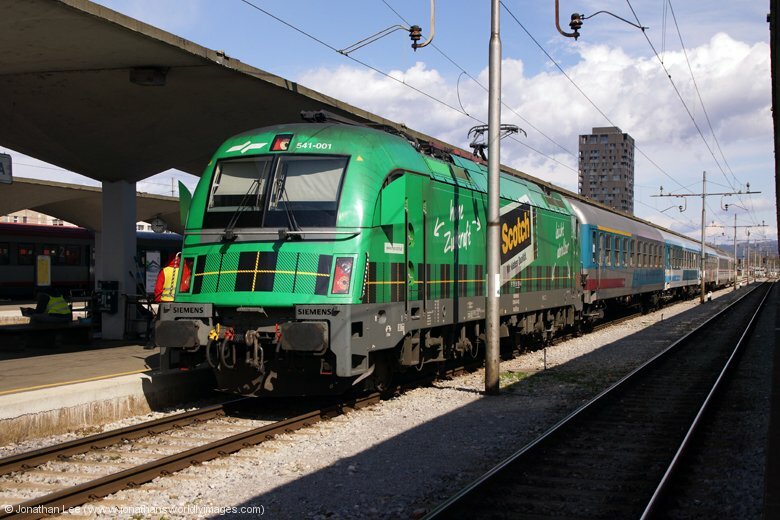 I wasn’t surprised to see MAV 470008 arrive into Graz with EC151 0755 Wien Hbf – Ljubljana, having had it on the same train the previous day, but had hoped it would get swapped for an 1144; no such luck though. With it being Easter Sunday though the train was relatively empty and we had the whole of the front coach to ourselves for the time we were on the train. 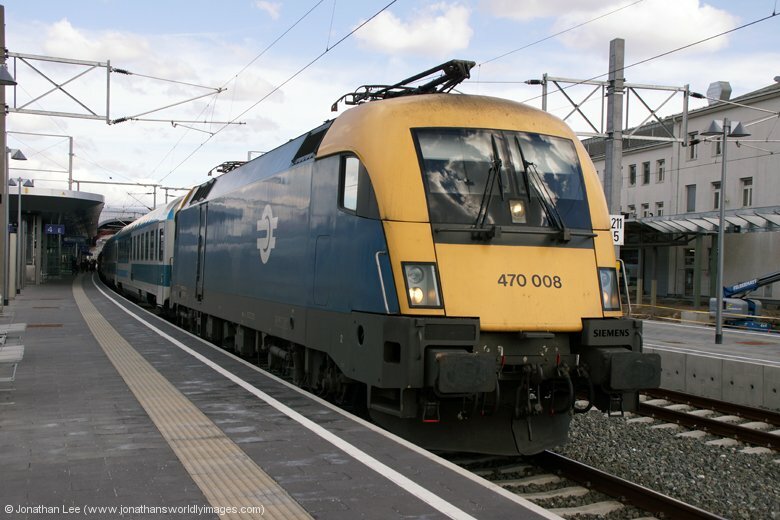 At Spiefeld Strass SZ 363005, in a light yellow livery, was soon backing down to take MAV 470008 off the train; it then loose shunted it through the station so the loco could then pan up at the correct end of the station and work under its own power! There was nothing to note at Maribor at all, and other than a few people drinking coffee at the only place open on the station, the place was deserted. 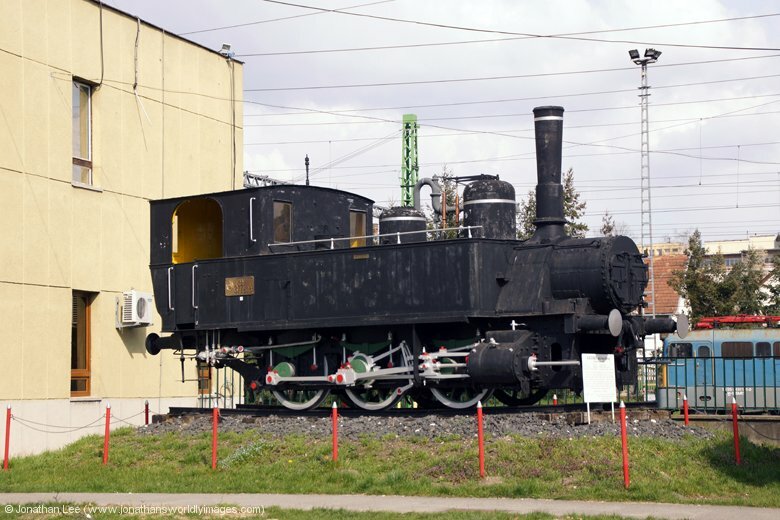 At Pragersko there were only three people got off EC151 and we were two of them and once 363005 had disappeared off the station became even more deserted than Maribor had been. 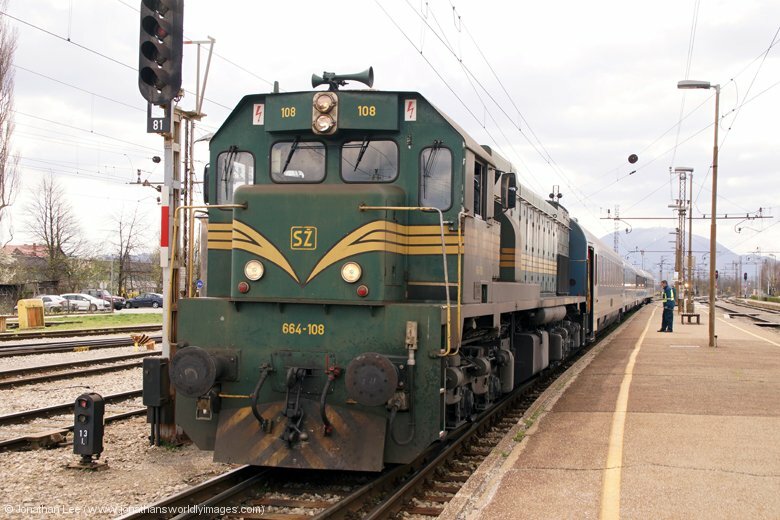 The growl of 664106 could be heard as it sat poised to drop onto the Citadella when it arrived, EC247 1025 Ljubljana – Budapest Deli. In the sidings south of the station were two other 664s; a walk down revealed them to be 664110 & 664101 and 664104 was found in the yard when the Citadella departed, 342022 having given way to 664106 quite efficiently. 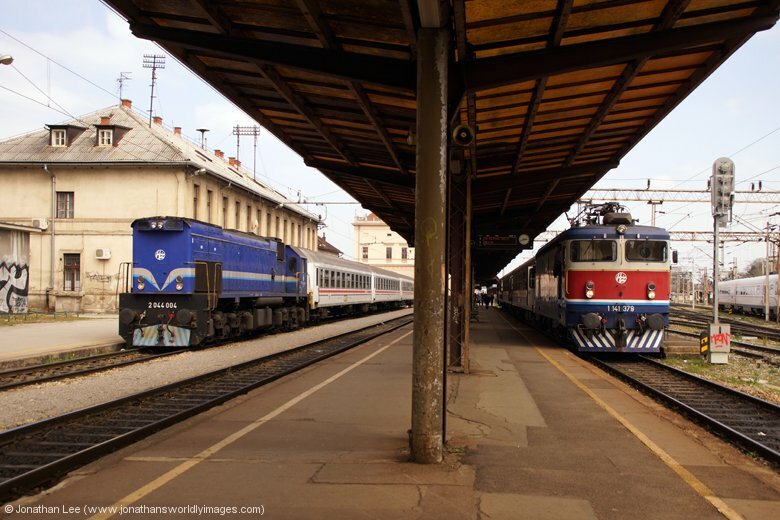 There didn’t seem to be many people travelling on Easter Sunday and there was plenty of room on board all the way to Zalaegerszeg. 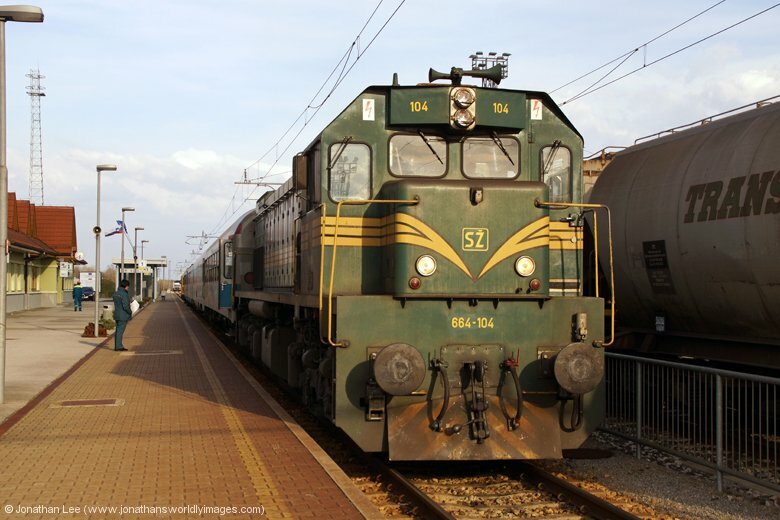 664106 was removed at Hodos for MAV 431189 to take the reins to Budapest and arrival into Zalaegerszeg was right time. A quick walk outside the station revealed nothing open at all and we soon got bored of walking down the road aimlessly and returned to the station to keep warm in the confines of the station waiting area. 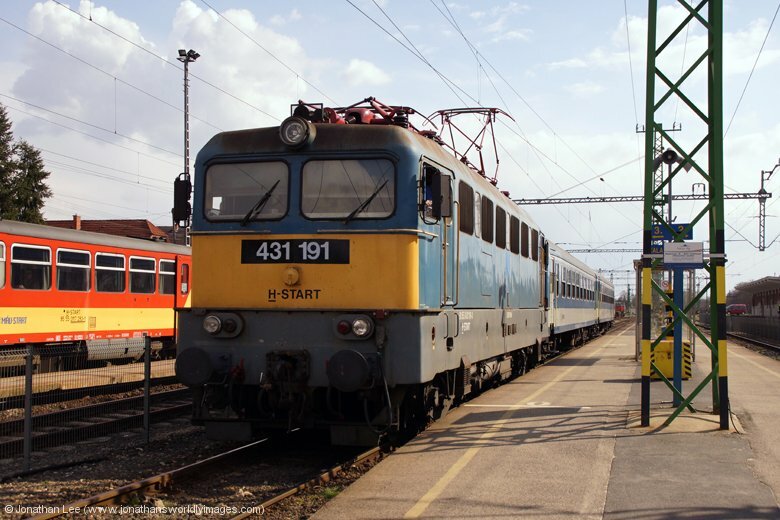 I couldn’t quite figure out what was going on with trains at Zalaegerszeg and had expected 431191 to depart at 1535 with train 9533 but when I didn’t confusion started to set in; this matter was rectified when I found out that the 1535 departure didn’t run and that 431191 was actually waiting with 953 1603 Zalaegerszeg – Budapest Deli, what was more was that 9504 1509 Boba – Zalaegerszeg was late coming in so a nice little move could still be done to Zalasventivan for it back in with what turned out to be 431002! 431279 turned up a little late with EC246 1335 Budapest Deli – Ljubljana, another train that was relatively empty, although it did fill up en-route into Ljubljana. I’d hoped for a different 664 to be sat waiting at Hodos when we arrived and wasn’t disappointed but was when I clapped eyes on 664104, which I’d had on the Borovnica drags the previous summer; still it had been the best 664 I’d had that week and certainly didn’t disappoint again with a very crisp turbo whistle and it was louder than the rest I’d had. Being an Alco man it’s not necessarily my cup of tea but I do appreciate a good loco when I hear one and kept going to the front of the train at station departures to get my fill of thrash. Of the choice at Hodos I was glad we’d got 664104 and not 664105. As food choices had been very limited during the day we opted to use the restaurant car on board and the woman running it spoke decent English and the menus were also in English as well. Food was freshly cooked and ok for a train cooked meal; as long as it was cooked properly! Unfortunately Danielle’s breaded chicken was still pink in the middle and had to be re-fried, which was literally done by taking the same food off the plate and nuking it to ensure it was definitely cooked! Other than that it filled a hole and it was a good job it had been available at all. 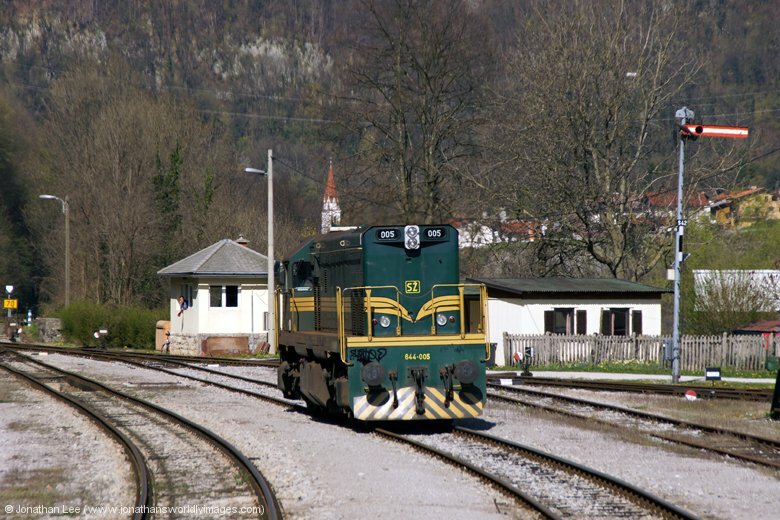 As could be expected 342022 took over from 664104 at Pragersko for the run into Ljubljana and deposited the train there about 20 minutes late. 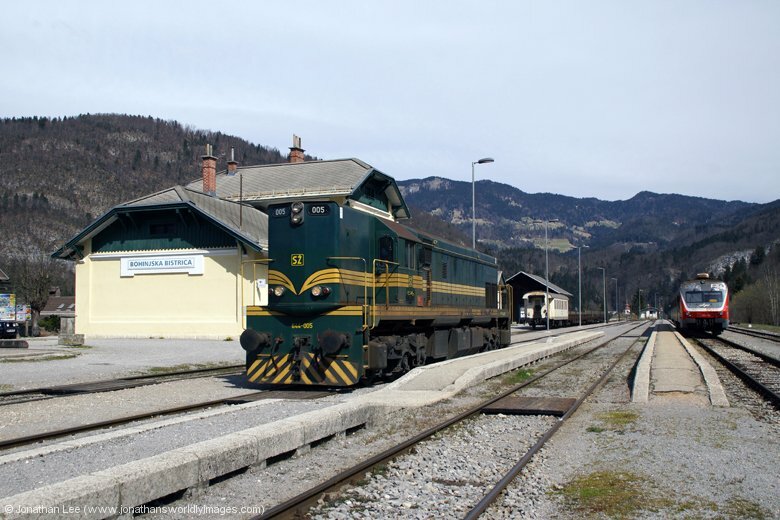 Single line working into Pragersko had resulted in us having to wait for 363013 to arrive with IC502 1725 Ljubljana – Maribor to arrive before we could depart. 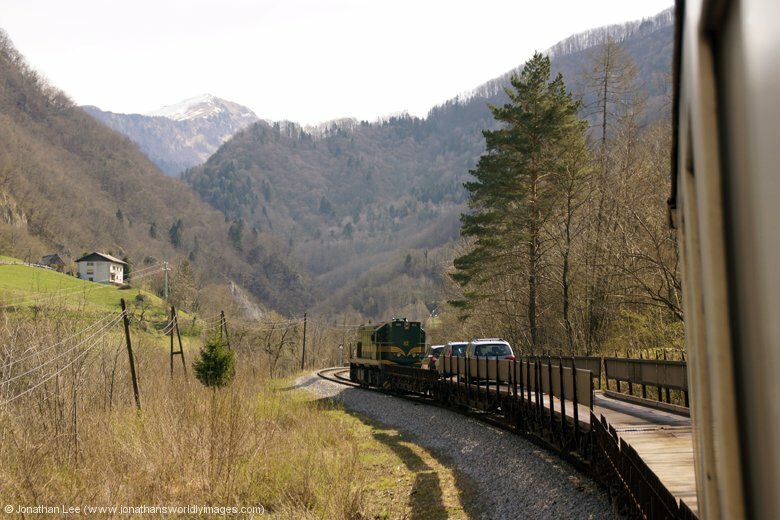 I suppose we should be thankful as everything that wasn’t loco-hauled on the line was cancelled between certain points during the period the engineering works were taking place; so there were literally only two trains a day running through from Pragersko to Ljubljana! It was a 10 minute walk from Ljubljana station to the Best Western Premier Hotel Slon, where we were checked in within moments and our large, clean, double room beckoned us in as we opened the door; we were ready for bed by the time we got there and having checked the weather forecast for the next few days we’d decided to get up at stupid o’clock and head to Postojna caves the following morning while the weather wasn’t looking to be that good. The idea being that we were underground when the weather wasn’t good and visiting Ljubljana castle later in the week when it looked to be better. 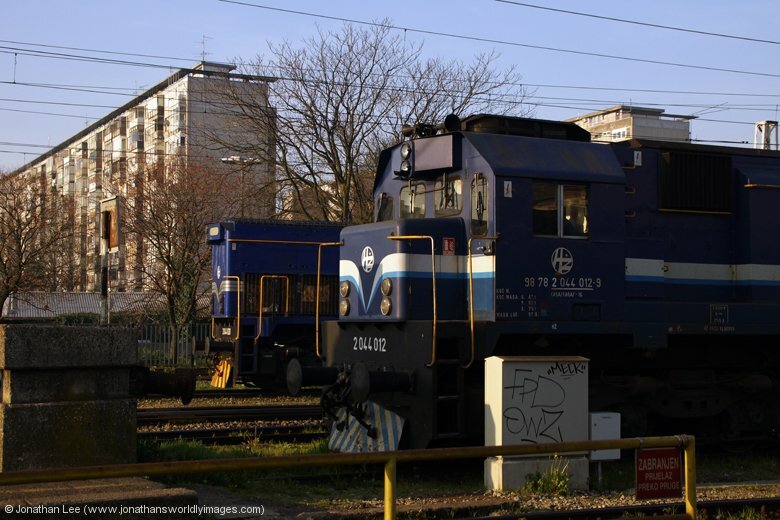 As luck didn’t have it 342025 was sat waiting with MV481 0635 Ljubljana – Rijeka; I’d only had three 342’s on my last trip and 342022, on EC246 the previous day, along with 342025 were two of them! The train was deserted, probably because it was Easter Monday, but very warm; the train heating clearly doing its job, and rightly so as it was only just above freezing outside. 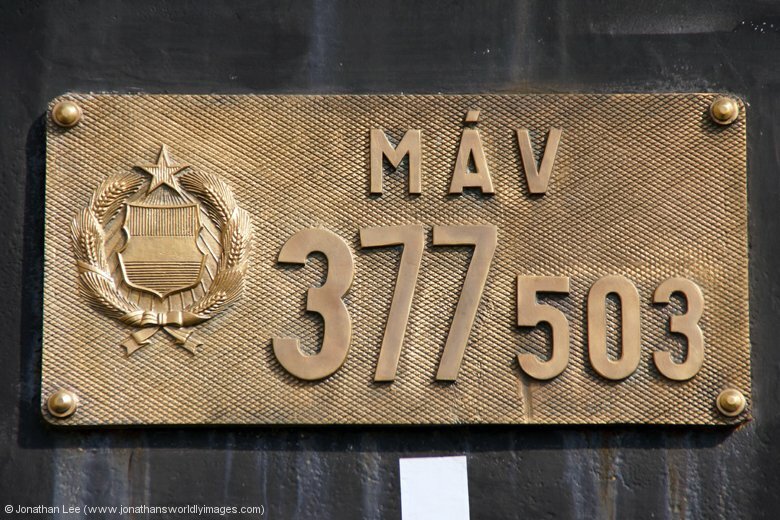 As we arrived into Borovnica the moment of truth came, would it be or wouldn’t it be a 664? 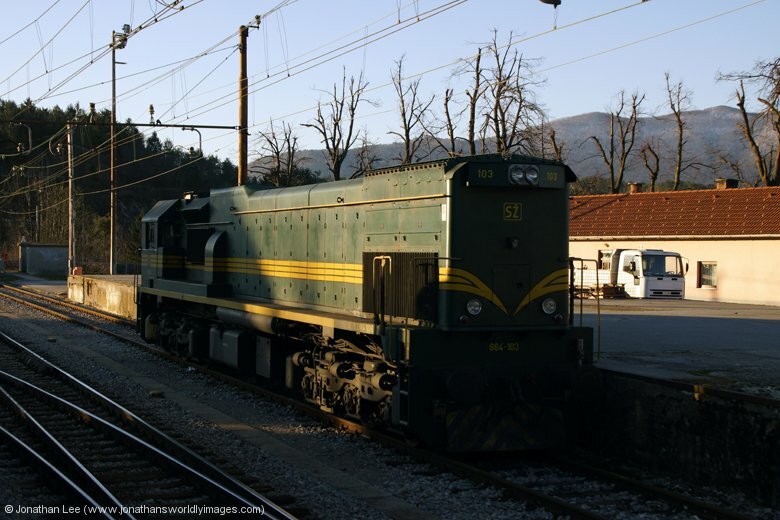 I managed to miss the only other engine in the station area as we arrived, a 664 at the Ljubljana end of the yard area, but was quick to spot the correct headlight formation and familiar green of a 664 in the distance; poised to drop down onto the top of 342025. 664119 soon revealed itself and the crew wasted no time in coupling it up. Bellowing up the hill was ok, if you were more suited to being an Eskimo! It was freezing outside and the wind chill didn’t help. On the way to Rakek we passed one freight, headed by a 664 and at Rakek 664103, 664117 & 664118 were waiting their next turns; there wasn’t a Hercules in sight anywhere, maybe the weekends were when they all got their exams? Last time I’d being in the area it had been the same at a weekend, with everything being 664 and nothing rubbish in sight at all! Once off the train its about an hour walk round the cave complex competing for space, photographs and room with everyone else there; it’s not a very well guided tour unless you’re in the guides’ pocket! By the time we got to the end of the complex and out to the area where the trains then take you back to the cave entrance most of the participants in our English group had already visited the souvenir shops and were waiting to be allowed down the ramp to the platform where the trains would be waiting to take people back. 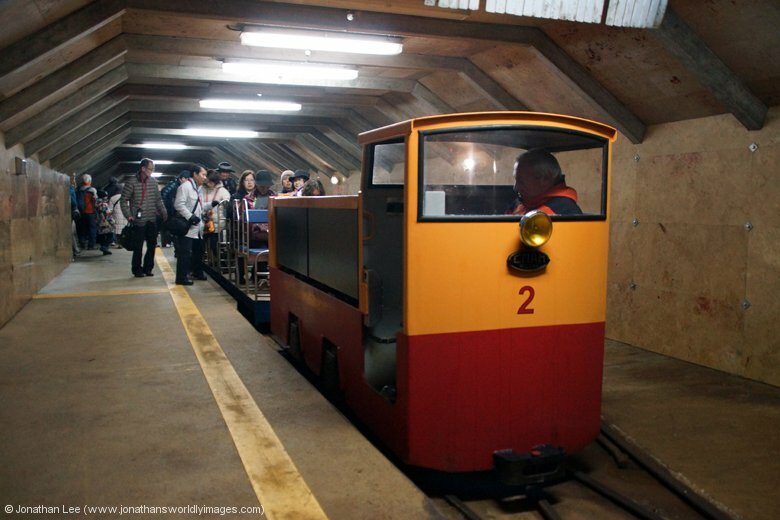 Once at the end of the tour you can basically wait for whichever train you like to take you back to the cave entrance, the set in when we got down to the platform had No.1 at its helm so I asked if we could wait for the next train, which wasn’t a problem at all and we headed back to the cave entrance with No.2 instead, sat right behind the loco in the front seats. The lack of traction en-route back to the cave entrance seemed to be more apparent, whether No.2 wasn’t as good as No.1 or whether it was a slight gradient back towards the entrance I don’t know but it lost traction on almost every turn and we could hear the grit, that was being thrown onto the railhead, being crushed as we ran over it; it did the trick every time though. The walk back to the station took no more than 30 minutes, even though most of it is uphill on the way back, and we were glad we got there when we did as the sunshine soon gave way to dark cloud and it began to rain. 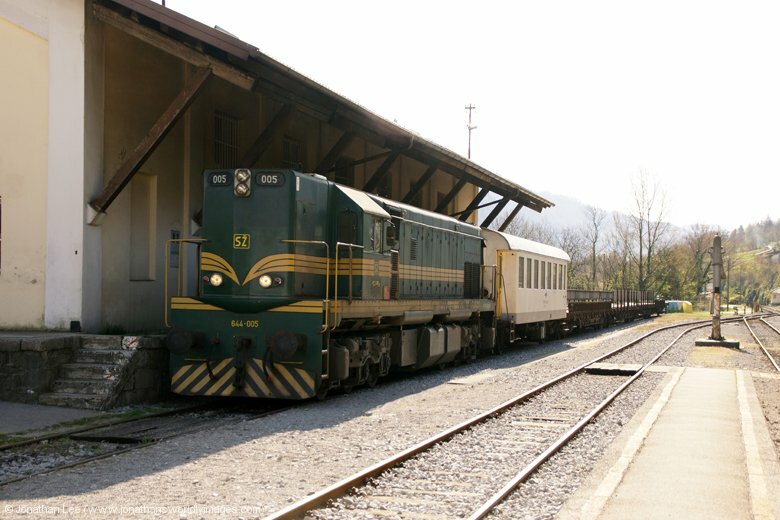 342025 returned with MV482 1155 Rijeka – Ljubljana, which unlike the outbound train was completely wedged. We ultimately sat in first class as there were hardly any seats but were kicked out by the guard and had to squeeze into a compartment in the end. Thankfully 664120 appeared round the corner at Rakek and dropped on to work through to Borovnica; 664103 was the only other engine there as we departed. 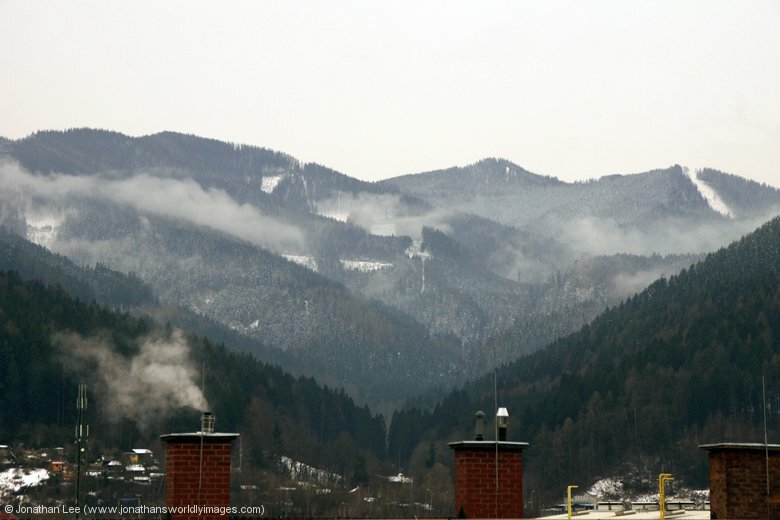 Not far outside the station, as we headed down to Borovnica, it began to hammer it down with snow; quite heavily too. It had gone from clear blue skies and glorious sunshine to black skies and driving snow in less than an hour! By the time we reached Borovnica though the snow had stopped and it was just cold and miserable; not very nice weather for the track workers to be out in. they were working towards Borovnica, still installing the foundations for electrification masts and only on the left hand road as we headed to Ljubljana. Progress looked to be very slow going and resulted in everything having to use the opposite road in both directions as their works train, loaded with machinery and equipment, took up the other. 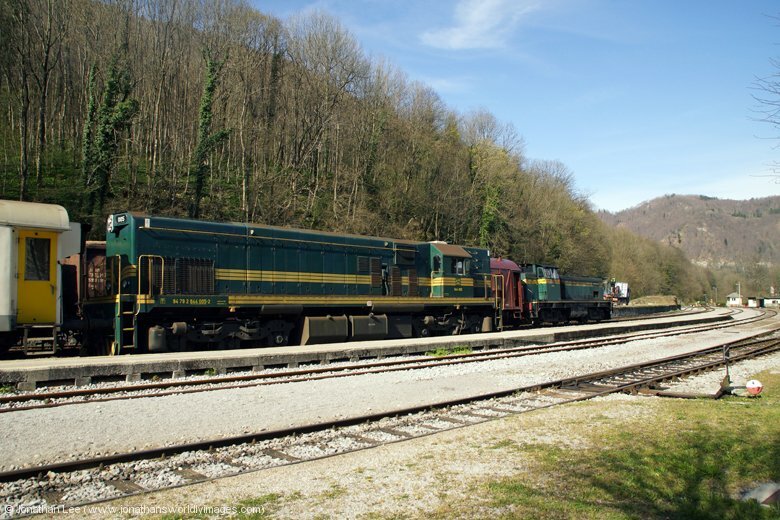 664120 was soon whipped off at Borovnica and with 664117 & 664118 already sat couple to freights, obviously waiting our arrival before they could head up the hill, 664120 looked like the only candidate to work MV483 1510 Ljubljana – Rijeka up to Rakek. 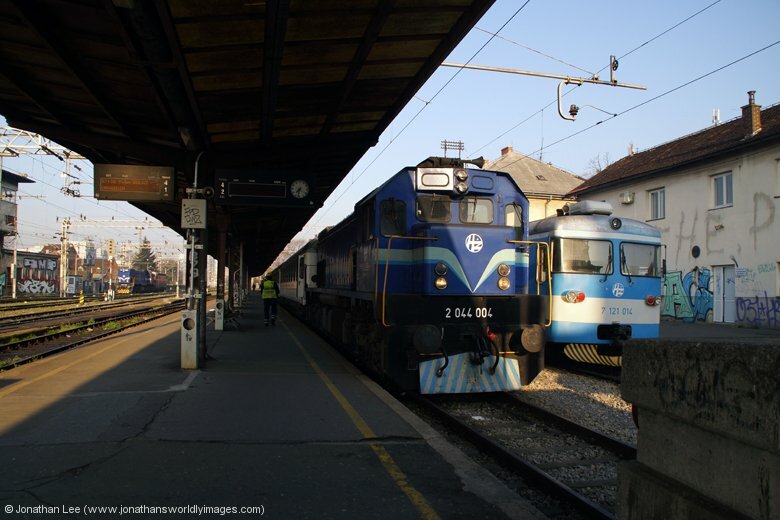 As 342025 arrived into Ljubljana we spotted 342023 sat waiting to depart with MV483, before heading over to get our bags from the luggage locker; which cost €3. We could have actually got them into a smaller locker for €2 but hadn’t realised there were any smaller until we collected the bags! 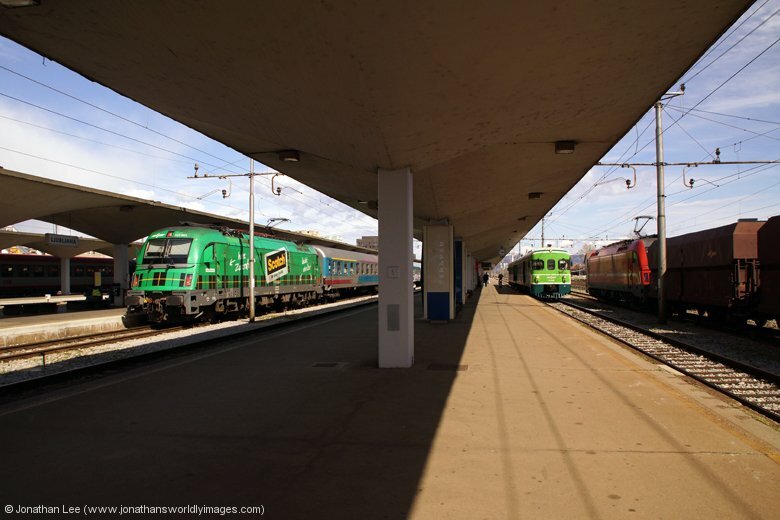 With a planned 1449 arrival into Ljubljana and a planned 1525 departure to Lesce Bled, there wasn’t much time to do anything other than collect the bags and EC210 0900 Vinkovci – Villach Hbf was in the station with plenty of time to spare before departure, headed by pioneer 541, 541001 in all its green splendor. Thankfully it wasn’t a full train and we had plenty of room to ourselves in a compartment for the 48 minute journey to Lesce Bled; where a taxi was waiting to take us to our hotel on the shore of Lake Bled. This was pre-arranged with the hotel and cost €12, which was payable to the driver after we’d arrived at the hotel. 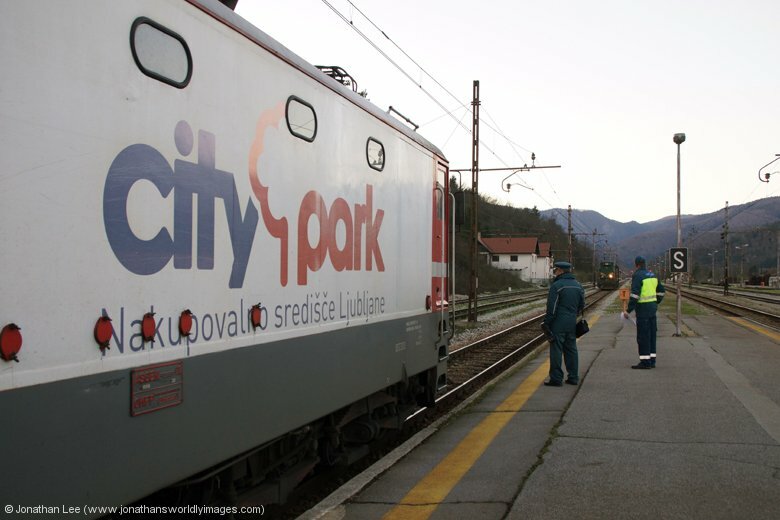 This was the only train related incident of the whole day……….. While the bus related incident hadn’t been a concern at the beginning of the day it had taken my mind away from the concern that had been on it at the start of the morning, which was whether there’d be a passenger coach on the autovlak or not; it had been seen quite a few times during early 2015 without a coach at all and as this was my first time doing the autovlak I didn’t really know what to expect. 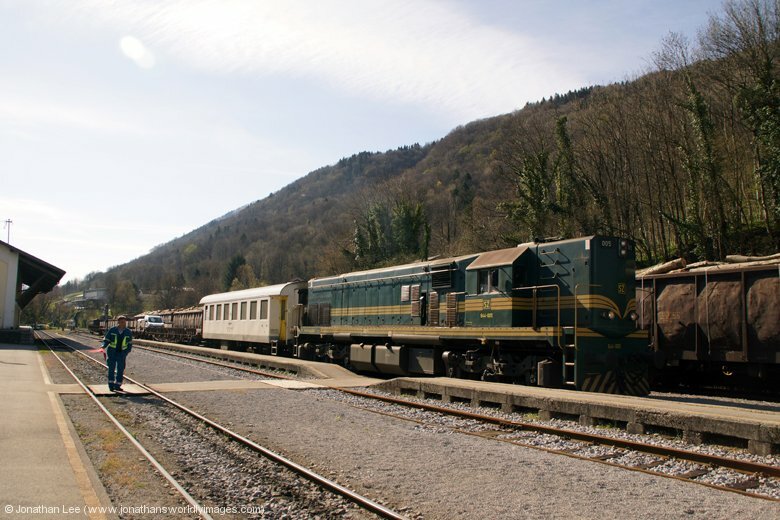 Thankfully the first thing I spotted, after the engine of course, was a nice four wheeled coach right behind 644005, with three car transporters behind that. My concerns for the day could then shift back to the bus and how it was going to affect me getting back to Bled and meeting with Danielle later! Unfortunately the sun is in the wrong place for photos while the train sits in the dock but even though I was on board this time as the train shunted out and back into the platform the guard let me get a photo at the front of the train as 644005 was re-attached to head north. 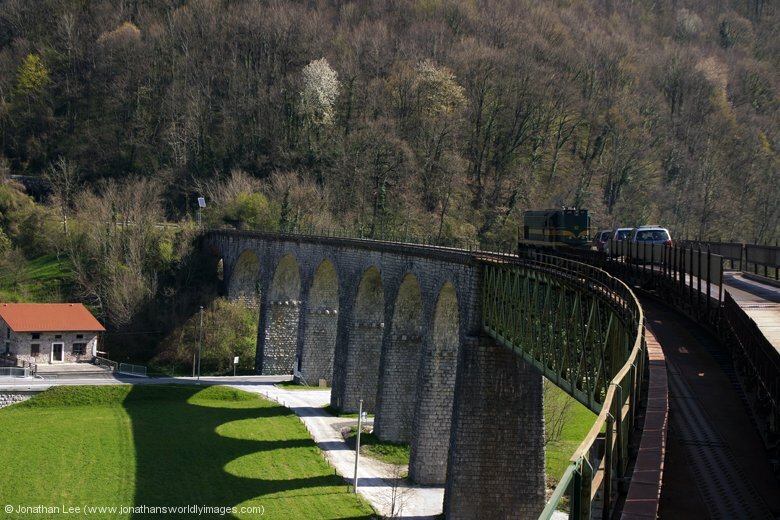 Photos of the train running over the viaduct on departure at this time would be cracking. 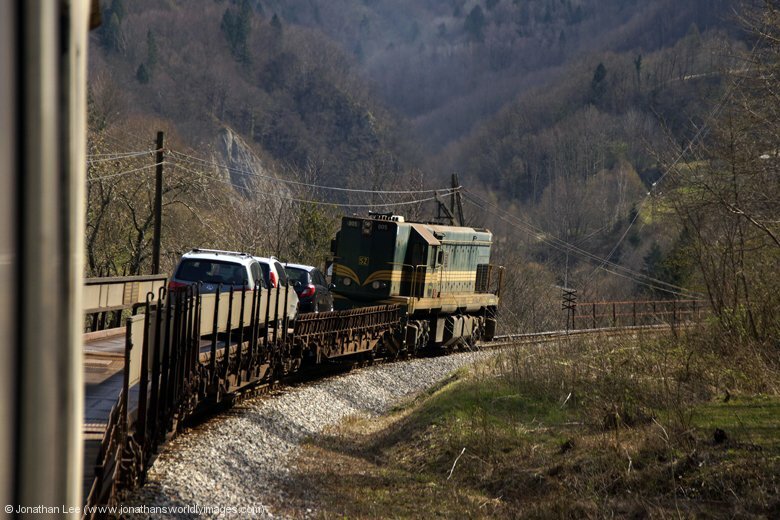 On board the 1035 Most Na Soci – Bohinjska Bistrica were the loco crew, the guard and me; with three cars up front on the car transporters. While uphill its quite hard to hear the little 644 from so far back, despite it having to work hard, so it was pretty much a morning of no thrash; even though there was plenty! It was a nice morning though and sunny too so it made for a better experience than it would have done if it was pouring it down. 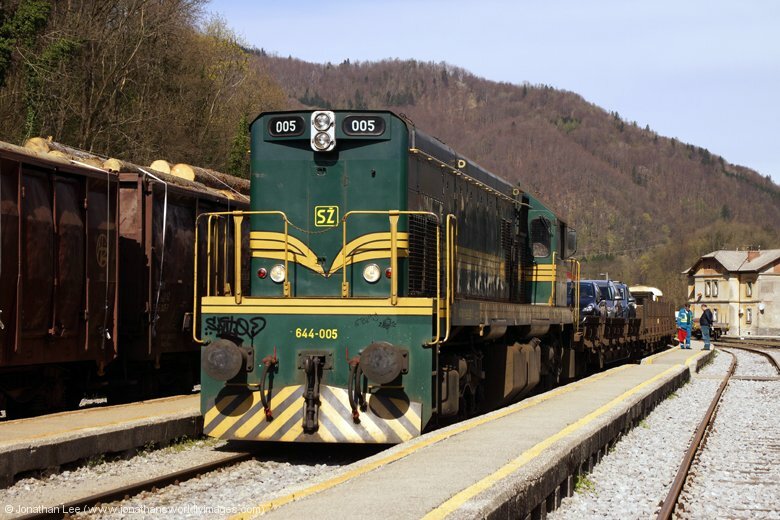 Having run round at Bohinjska Bistrica 644005 would then only run shuttles through the tunnel to Podbrdo for the rest of the day and the 1136 shuttle was pretty much a waste of time with only me as a fare paying passenger and no cars at all. 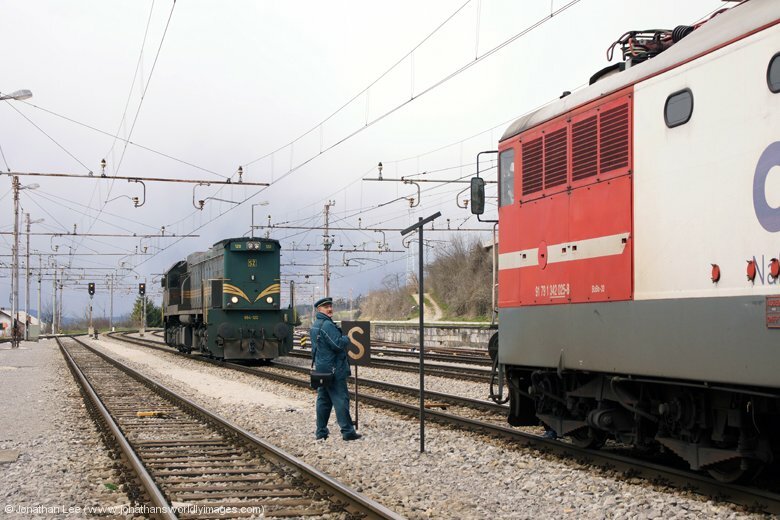 A crew change took place at Podbrdo after arrival the relief crew arriving off a southbound DMU and the existing crew disappearing south on it. 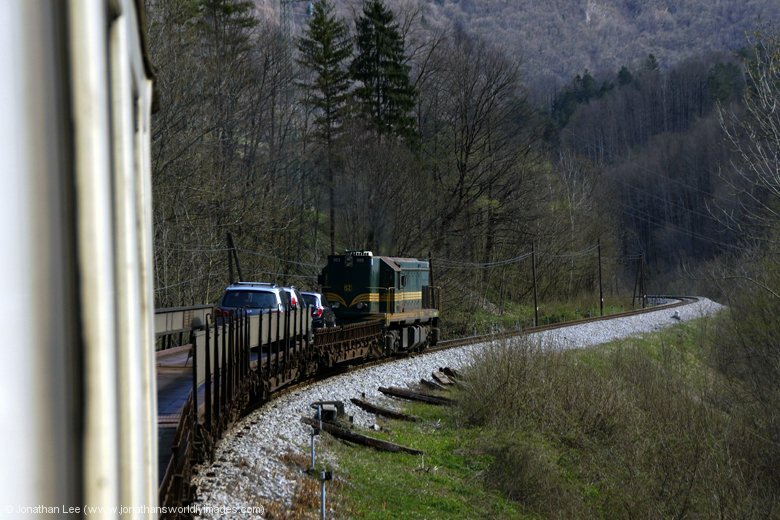 As the southbound DMU departed about 7 minutes late I contemplated what was going to happen at Bled Jezero when I got there off the bus. 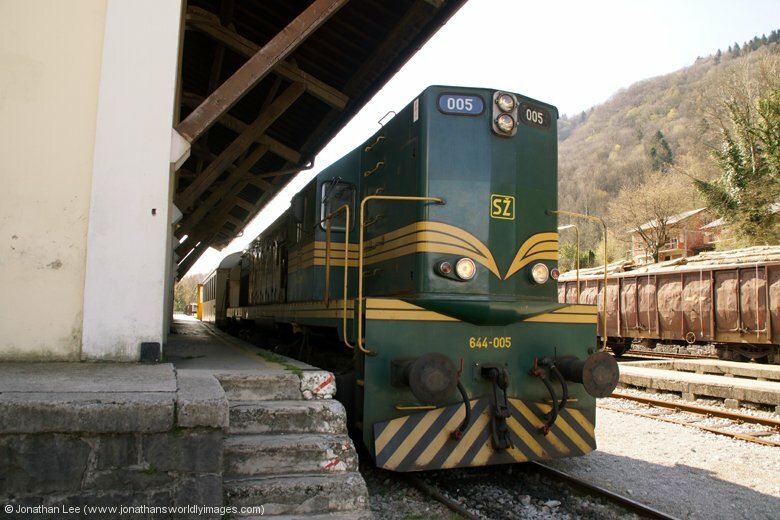 I’d arranged a taxi to take Danielle to the station and for her to get on the same DMU I’d be on towards Jesenice, which would now be a good 15-20 minutes later than booked off Bled Jezero as it would have to cross the southbound DMU before it got to me at Podbrdo and then lose more time during the bus section. 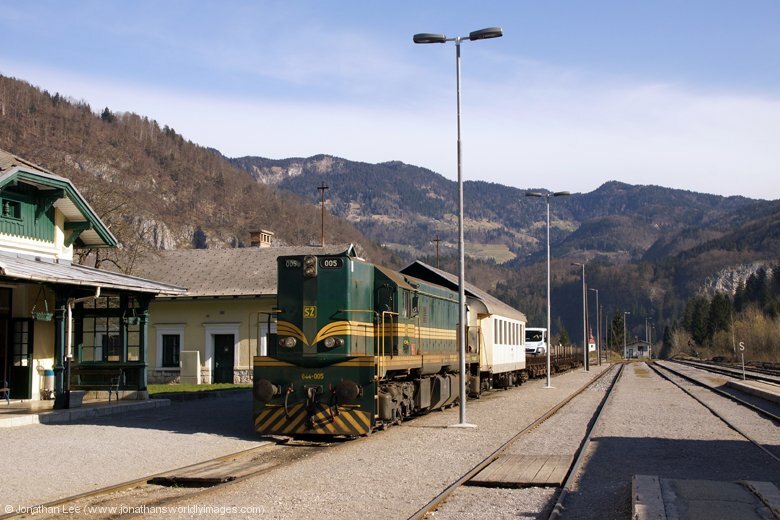 The 1303 departure from Bled Jezero was only a plus 20 at Jesenice for EC211 1253 Villach Hbf – Vinkovci, which we needed to be on to Ljubljana. My conscience got the better of me and while I waited at Podbrdo I rang the taxi company up and had a taxi waiting at Bled Jezero for my arrival off the bus. 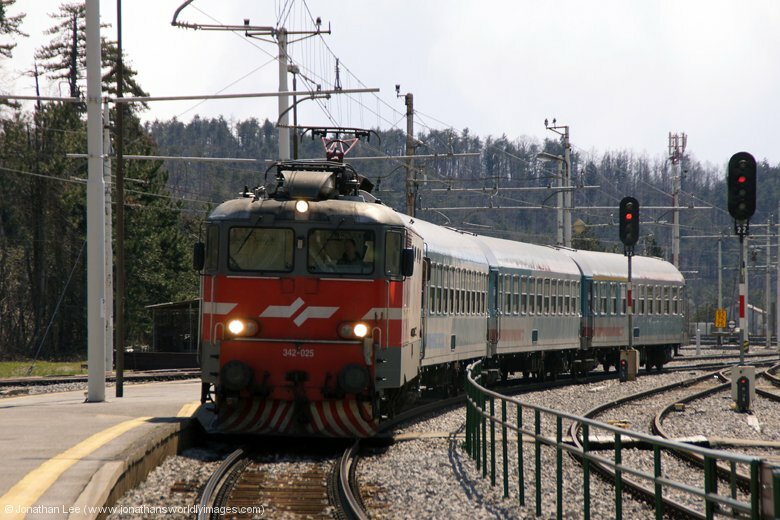 As I predicted SZ 541017 did the honours to Dobova where HZ 1142012 was waiting to take us through to Zagreb. The border checks were harmless enough even if the guy checking my passport had clearly been missed off the list when manner were being handed out and when I stood up to show him which page my entry stamp to Slovenia was on he barked at me to sit down; so I just left him to it and sat back down trying not to let the rage inside show on the exterior! Having not expected to be in Zagreb we’d spent the previous evening looking on various apps, including Triposo, to find something to do in Zagreb; we’d not really come up with much so basically just went on a blind walk round the town.We got back to the Best Western Premier Astoria just after 1300 and our room was ready and waiting; for the second day in a row we were upgraded to an executive room. The one in Ljubljana was definitely the better of the two though and more spacious but we had no reason to complain about anything and settled in to our executive room quite nicely. 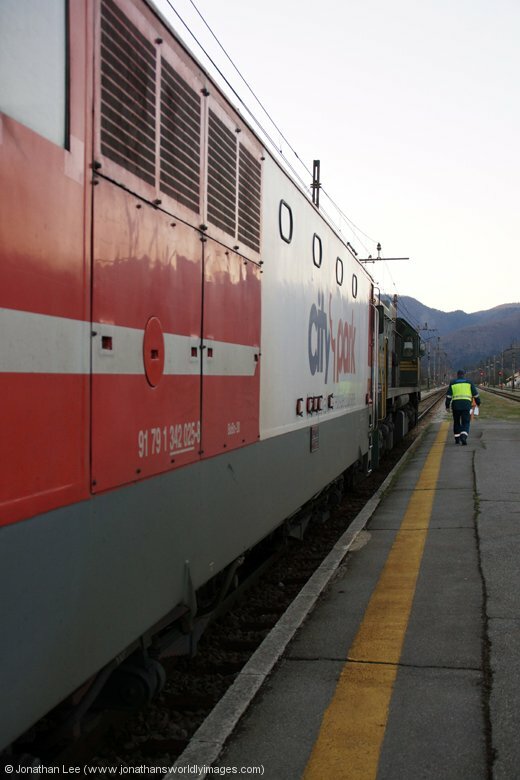 An afternoon of trains beckoned and I used the hotel WiFi to check the HZ Mapper to see what was coming into Zagreb, having checked it the previous afternoon in Ljubljana to figure out what was loco-hauled out of Zagreb in an afternoon. My original plan had been to cover the four rush hour 2044 hauled trains available in an afternoon/evening but the HZ mapper revealed two of the four 2044’s to be dud and one not allocated so I set about planning a move with electrics on the Dugo Selo line and with at least five new electrics coming in and one already allocated going out it looked like it could be an interesting afternoon, starting with 1141384 on 2017 1445 Zagreb GK – Vinkovci. 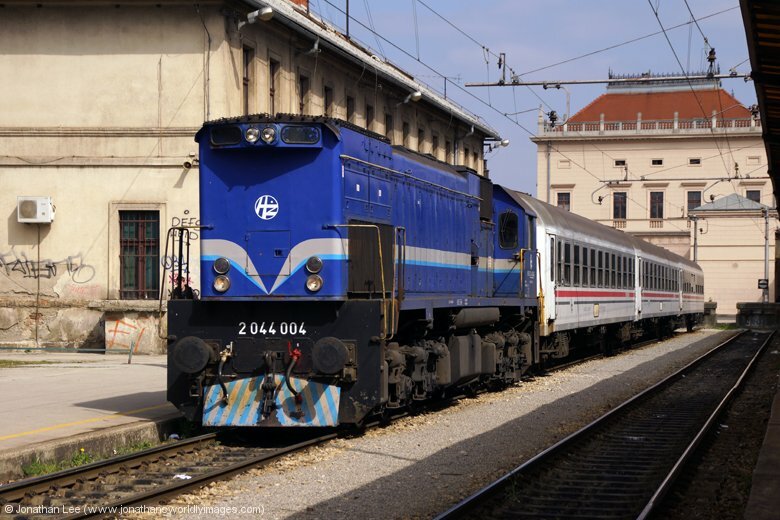 Having already decided to flag 2044004 with 790 1512 Zagreb GK – Varazdin, which was the unallocated fourth 2044 turn I took a punt that it would return in the morning and hoped for the best as I walked down to get on 1141384. 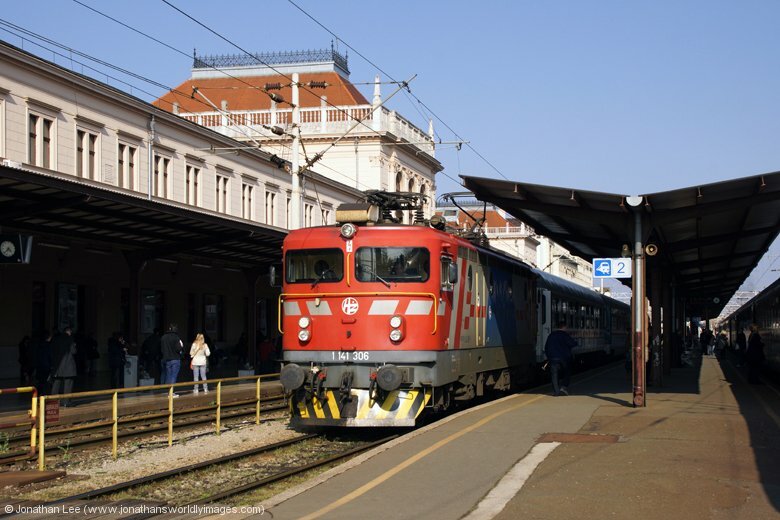 Thanks to a bit of late running, which seemed to be rife through the afternoon having looked at the arrivals screen, 1141384 made a minus onto 1141310 at Culinec, which headed 2014 0944 Vinkovci – Zagreb GK back into town. 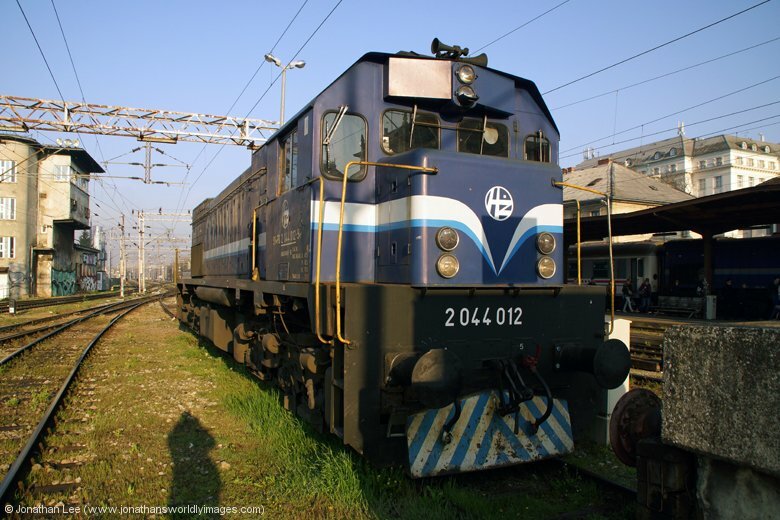 2044012 arrived shortly before with 3013 1213 Varazdin – Zagreb GK and set about running round to form 3010 1524 Zagreb GK – Varazdin. 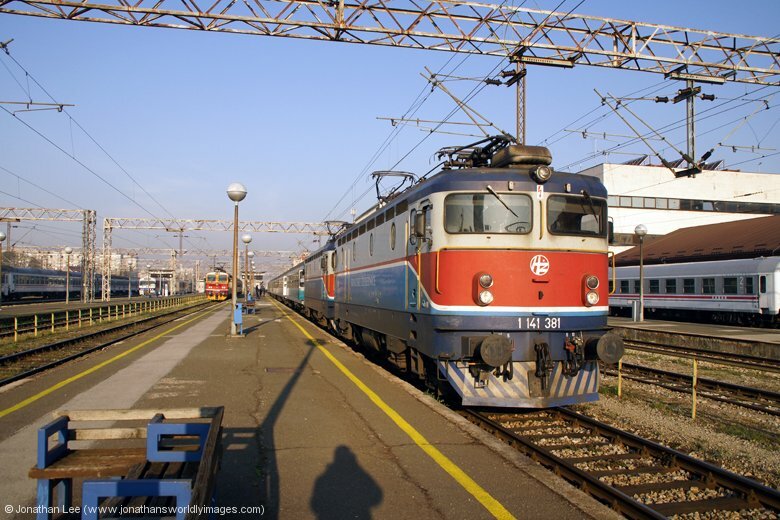 As 3015 1418 Varazdin – Zagreb GK was one of the dud 2044’s I’d seen on the mapper, 2044008, I decided not to waste my time doing the 1524 out for a dud one back and continued with my electric bash instead; now hoping that both the two 2044’s I’d flagged would return the following morning. 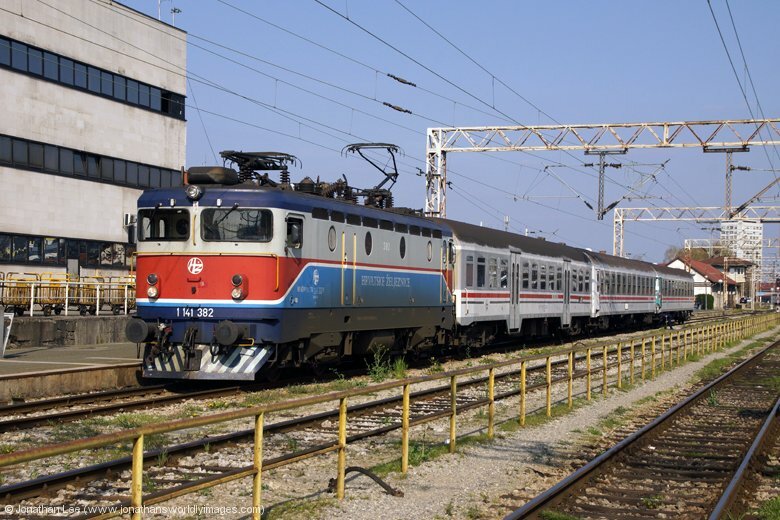 1142003 headed up 745 1518 Zagreb GK – Vinkovci and dropped me nicely into 1141306 at Dugo Selo which was working 702 1200 Osijek – Rijeka; the mapper had showed 2044019 to have worked the train from Osijek to Koprivnica. 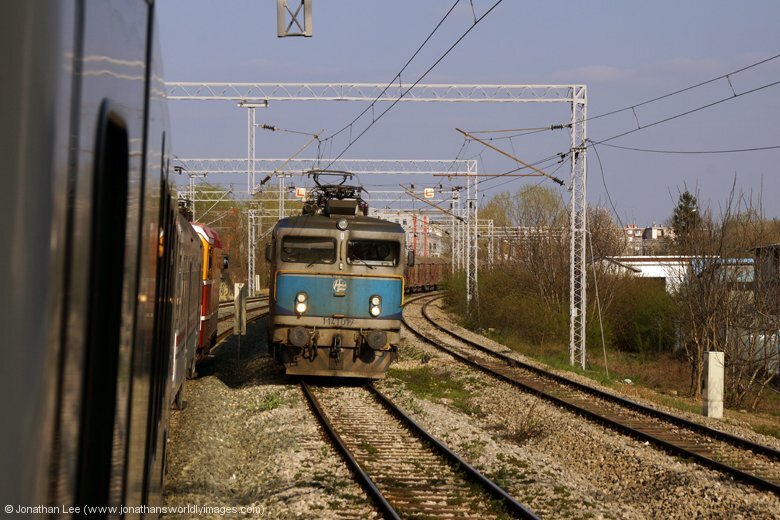 Having got off at Sesvete en-route into Zagreb 1141382 was hot on the heels of 1141306 with 2016 1100 Vinkovci – Zagreb GK. 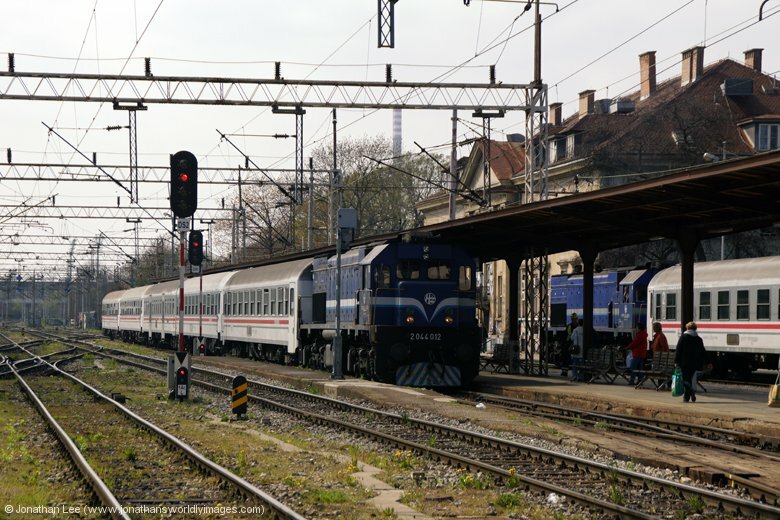 With a bit of time to roam around and figure out what was going on I then found 1142010 sat with the set to form 2209 1650 Zagreb GK – Koprivnica and already knowing that 1124015 was inbound with 2018 1133 Vinkovci – Zagreb GK it made for another quick and easy win, win move to Sesvete this time. 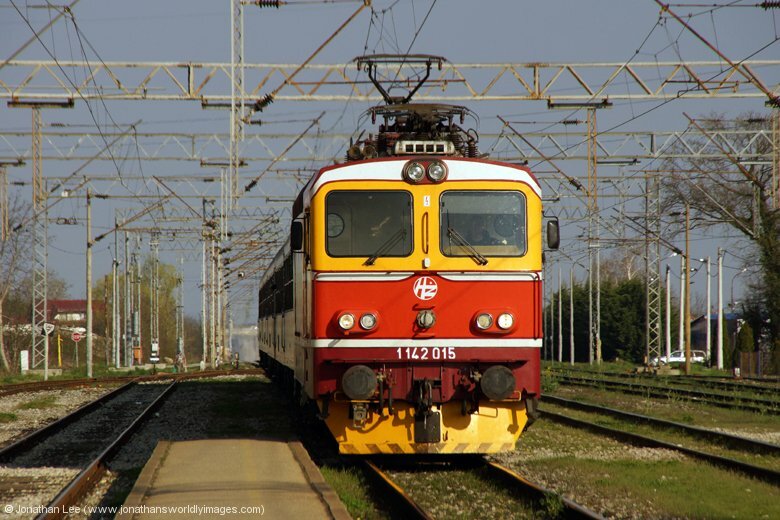 Finally I opted to do dud 1141380 out to Dugo Selo with 971 1839 Zagreb GK – Koprivnica for a pair back in, 1141304/1141390 with 2020 1452 Vinkovci – Zagreb GK. A decent evening, even without 2044’s involved, but I walked back to the hotel hoping that the two I’d flagged would return the following morning, already having a crap move in my head to get them in! Our honeymoon really was over as we walked back to the hotel and prepared ourselves mentally for the trip home the following morning. I couldn’t resist nipping back to the station to attempt to get the shunt in with the coach that comes in from somewhere and is shunted onto EN499 2120 Zagreb GK – Munich Hbf; I’d seen the same happen in the opposite direction during another trip to Zagreb and was determined to get a little 2132 shunting device in the book; although it looked as though my attempts were needless and the shunt move may only take place in the summer months as there was certainly no coach to shunt onto the set off every train I watched arrive. 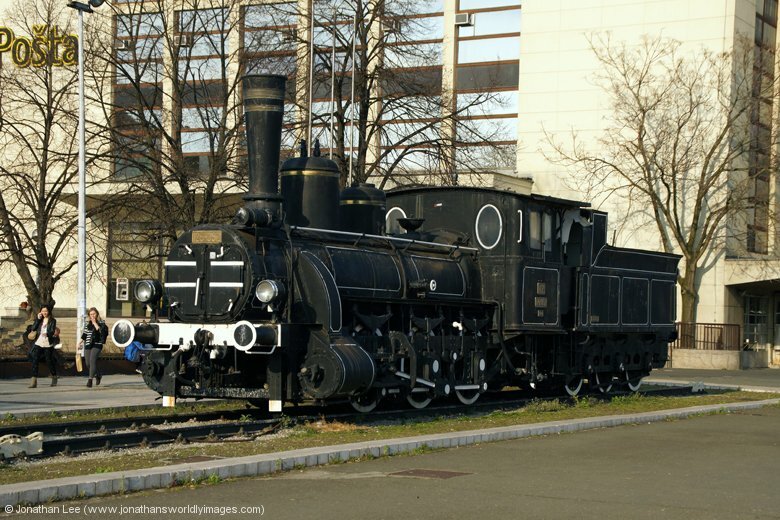 Yet randomly I still managed to get the shunting device in the book as it backed the set in to form EN499 2120 Zagreb – Munich! Randomly it got held at the signal of platform 1:2 while an EMU departed platform 1:1 ahead of it so I walked down to investigate. 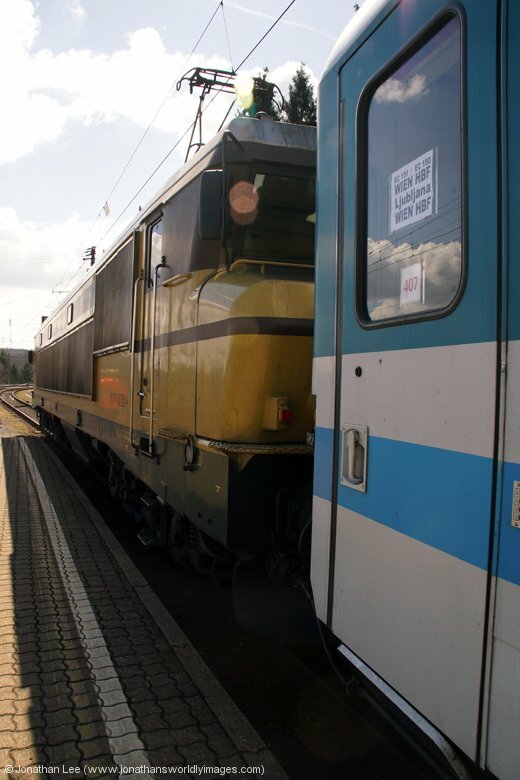 The rear doors of the train were open and a shunter was standing at the offside; seconds before the signal came off I beckoned to him to see if he’d let me on and while he was looking for the signal to come off, just as it did he gestured with his hand for me to board, without actually making eye contact, all the while just concentrating on the outside world and his shunt! I wasn’t bothered either way as 2132322 was caned in as it shunted down the platform. Back at the hotel everything was packed in readiness for the following morning’s departure. 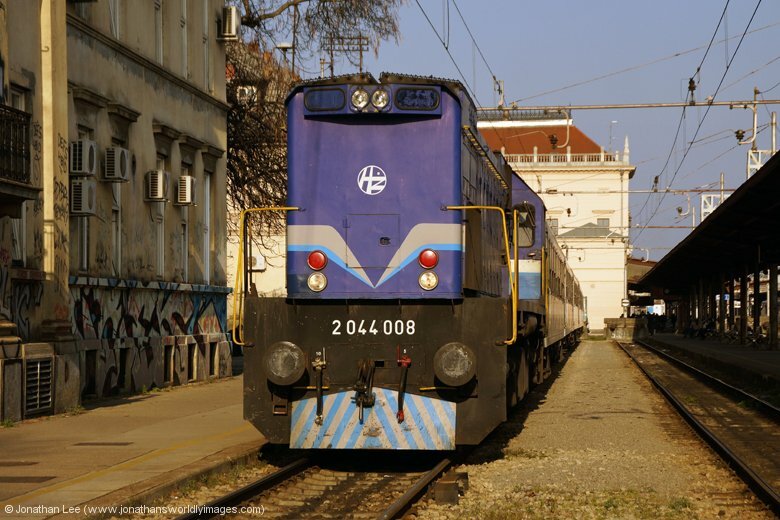 With an early alarm call I was on the HZ mapper the moment I woke to check what was coming into Zagreb from Varazdin and was more than pleased with what I found as not only were 2044004 & 2044012 inbound so was 2044027, which had replaced either 2044007 or 2044008; so that was three new ones to contend with, which was better than I could have predicted. 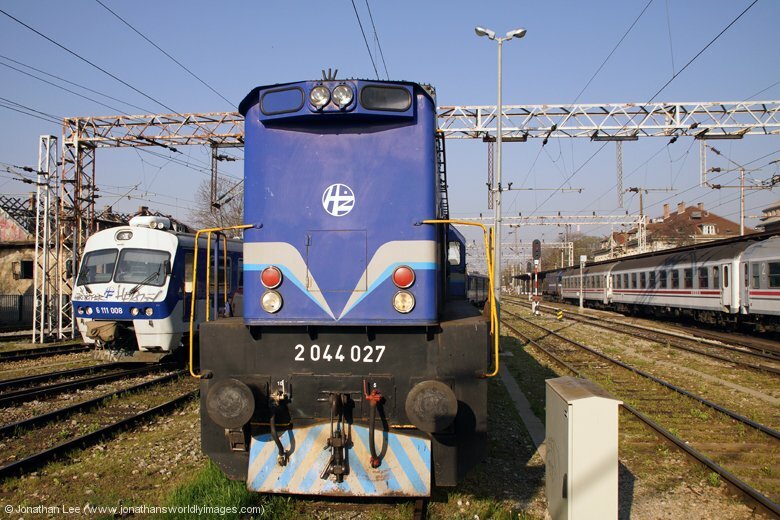 I was soon out of bed and down at the station for the 0701 EMU to Kustosija to do 2044004 back in with 3005 0428 Varazdin – Zagreb GK. 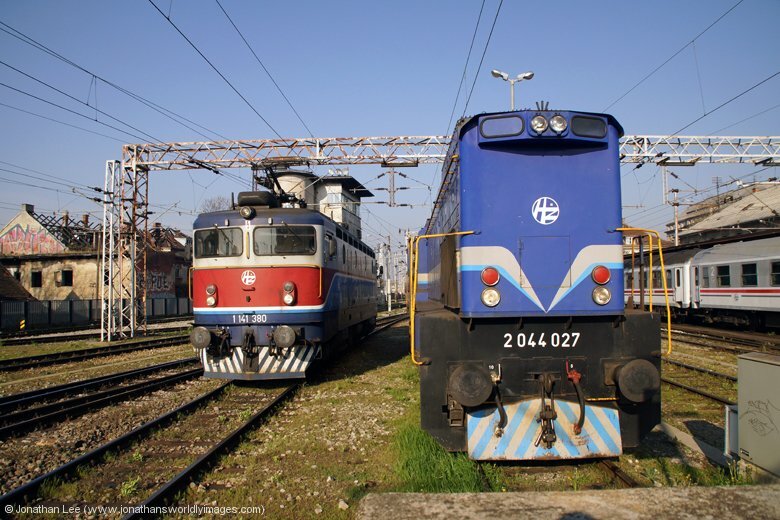 Upon arrival 1142016 was just shunting 2044020 off IC571 0534 Varazdin – Zagreb GK, the 2044 having been dragged dead inside to Zagreb and would likely balance up the afternoon turn that appeared to not have an inwards working! 2044004 made the 0734 EMU back out to Zagreb Zapadni Kolodvor to do 2044027 back in with 991 0525 Varazdin – Zagreb GK at which point I could relax a little when I made the minus onto 2011 0745 Zagreb GK – Vinkovci with 1141381/1141384, which I did out to Maksimir for 1141382 back in on 2010 0603 Novska – Zagreb GK. 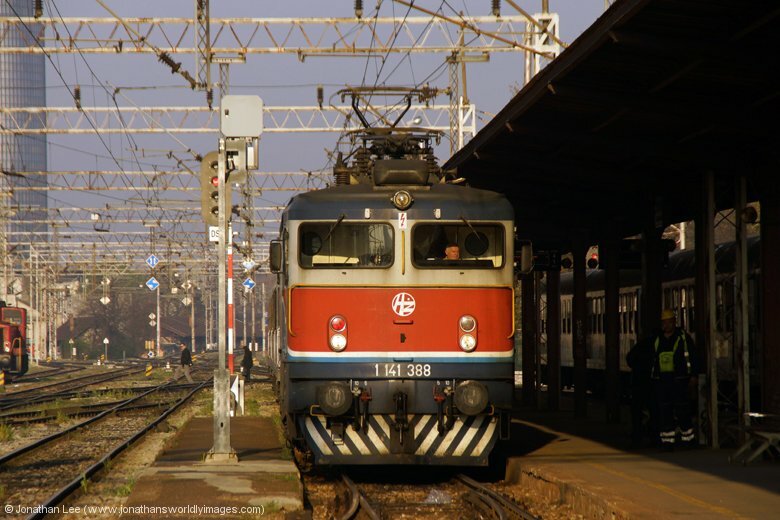 Having a little time to kill before 2044012 departed with 3004 0903 Zagreb GK – Varazdin allowed for some chilling on the station but when 2132324 sat in the carriage sidings adjacent to the station with the stock to form 397 0918 Zagreb – Sarajevo I became interested when two passengers just walked across the tracks, opened the rear door of the train and plonked themselves down in one of the compartments. 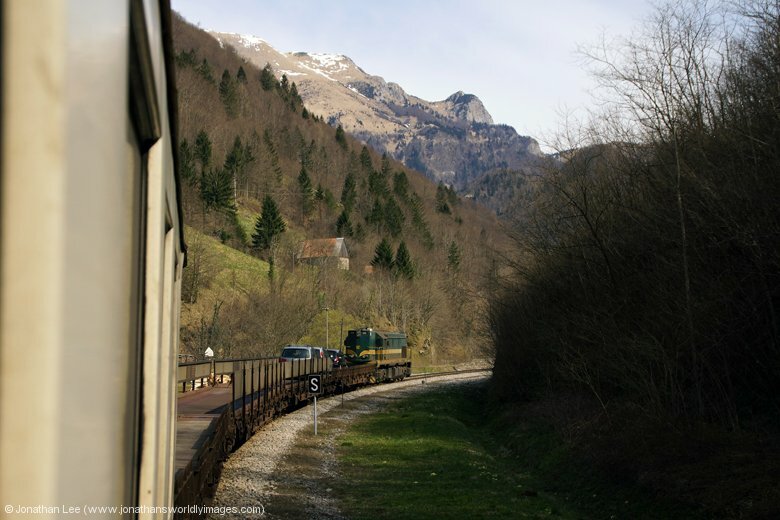 Shortly afterwards the guard followed suit and turned the train lights on before sitting himself down in the coach behind the engine. As I saw it I had nothing to lose so waltzed across to the set, trying to look as much like a local as I could, while still keeping an eye out for other movements in the station. When I got in the back door and walked by the two who’d already they didn’t even so much as cast a glance my way as I walked by and sat down in the middle of the coach. I was quite glad the guard didn’t come down during the shunt though as, as normal as it might seem to locals it still felt a little wrong doing what I’d just done but it was all over quickly and once I’d done 2044012 out to Zagreb Zapadni Kolodvor I walked back to the hotel for breakfast, quite pleased with how the morning had gone.